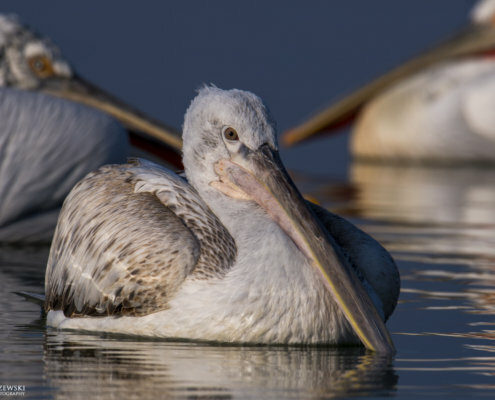 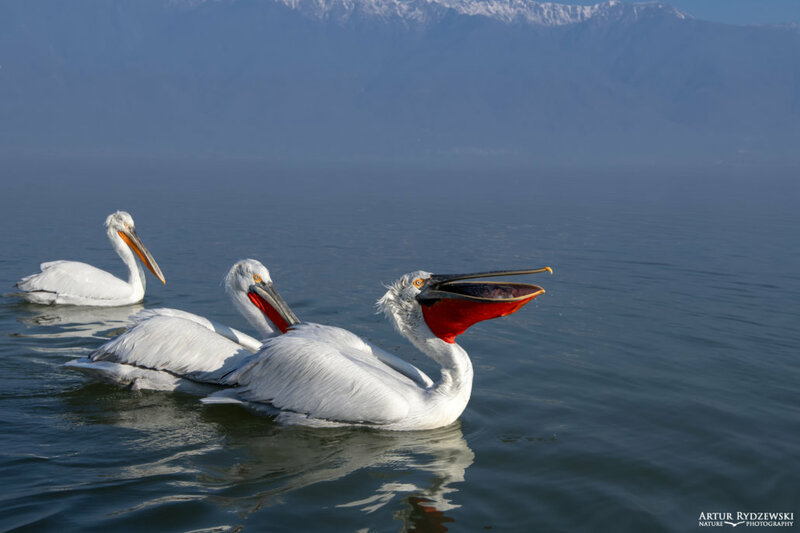 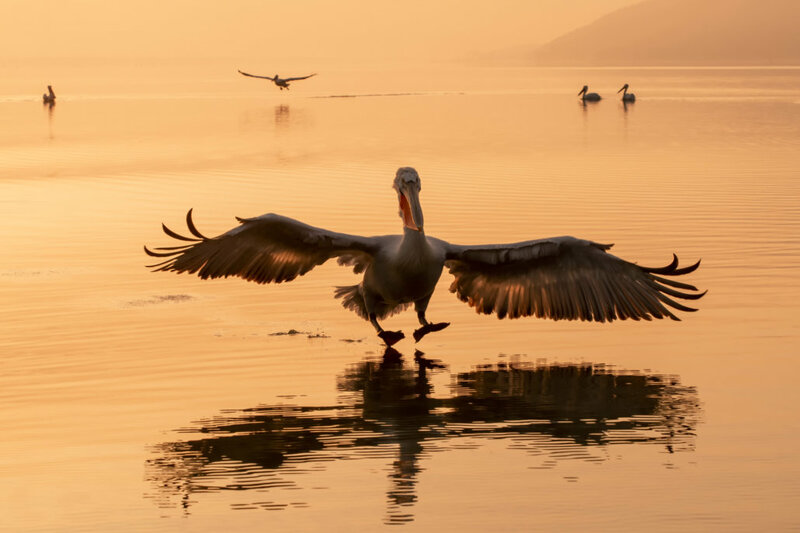 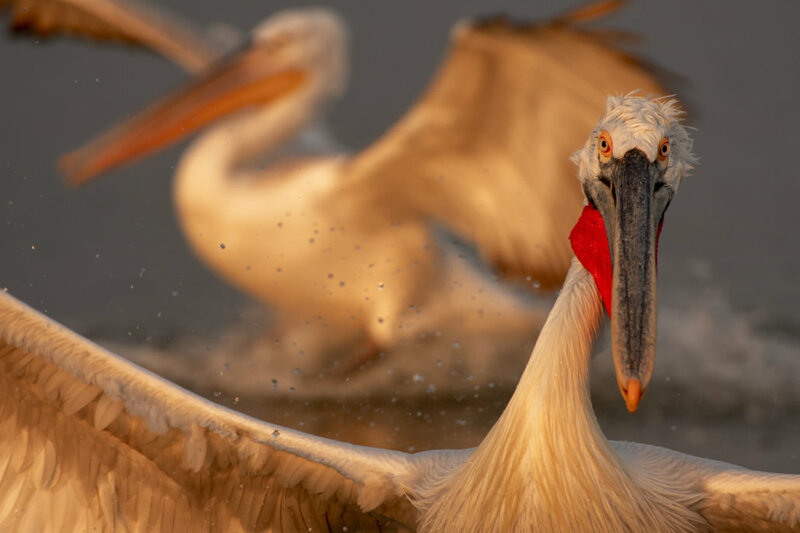 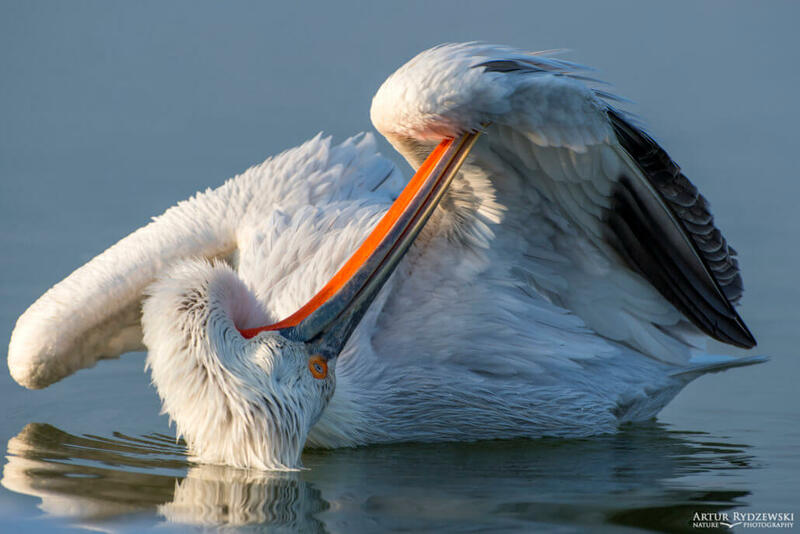 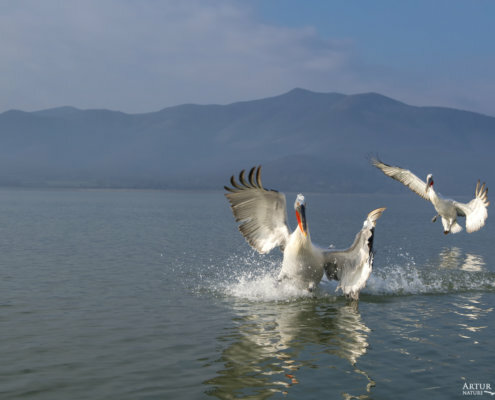 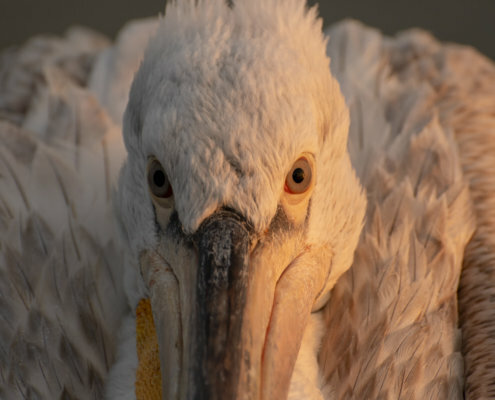 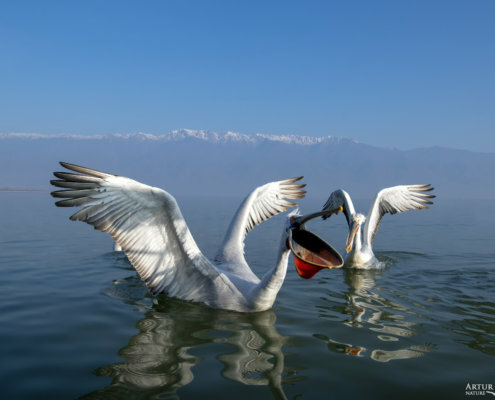 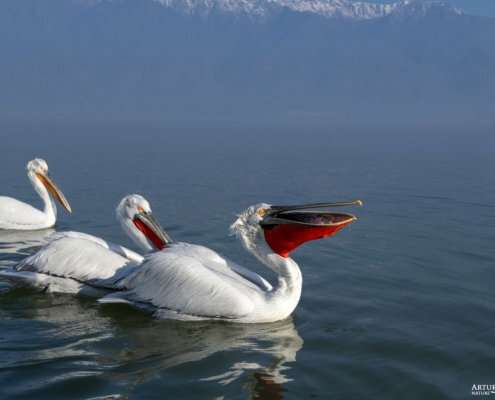 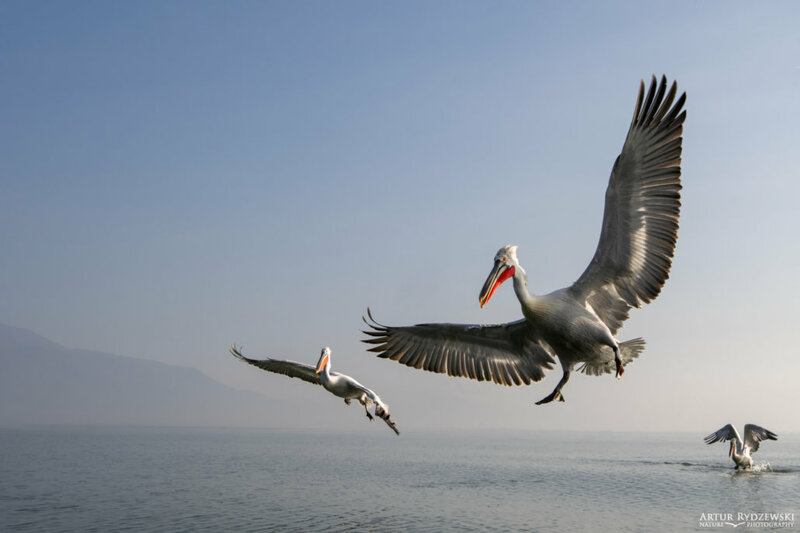 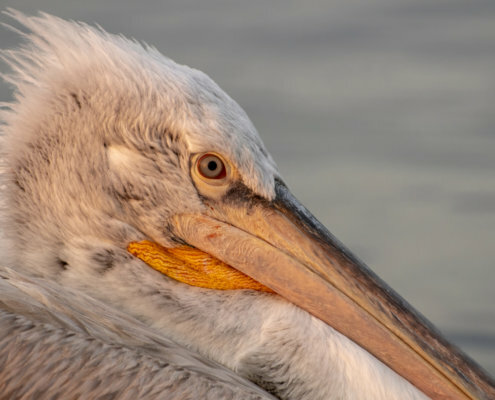 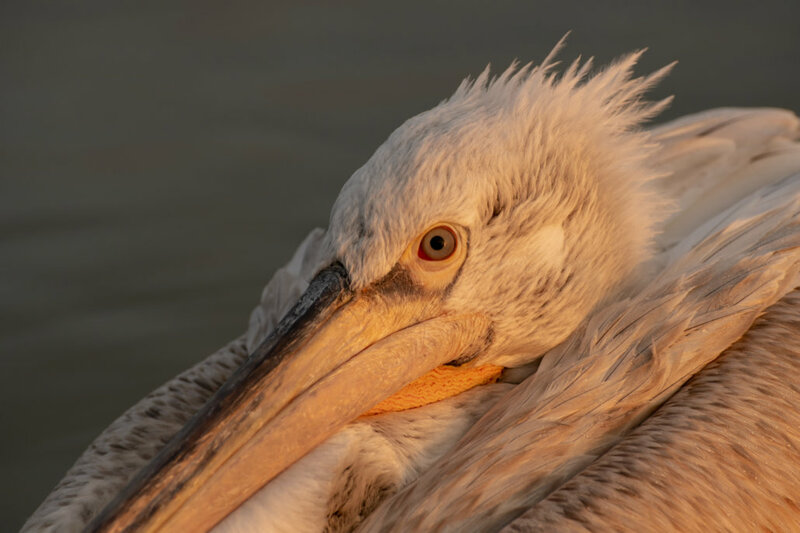 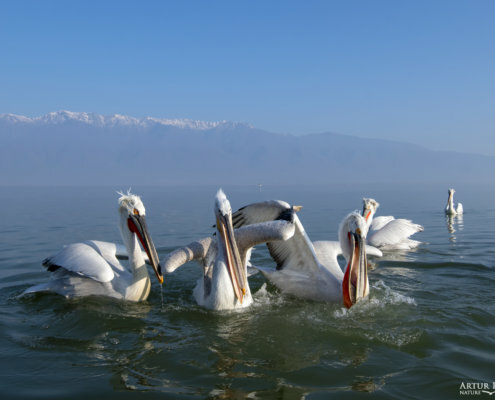 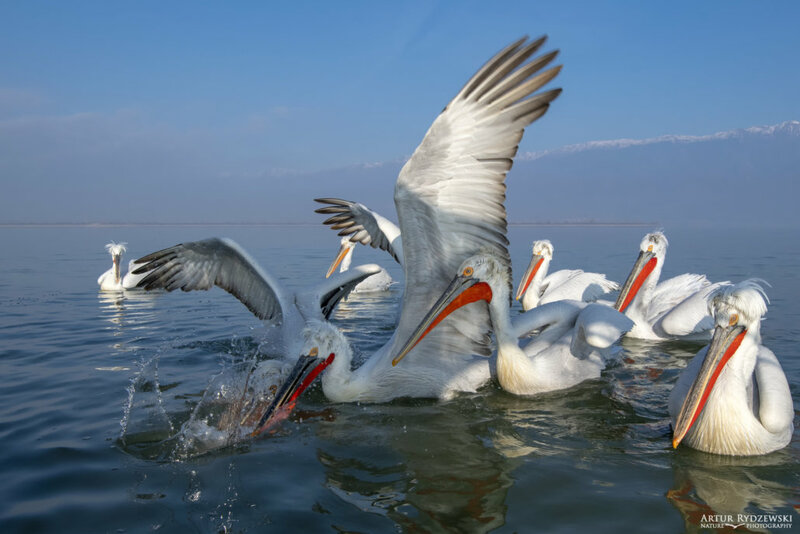 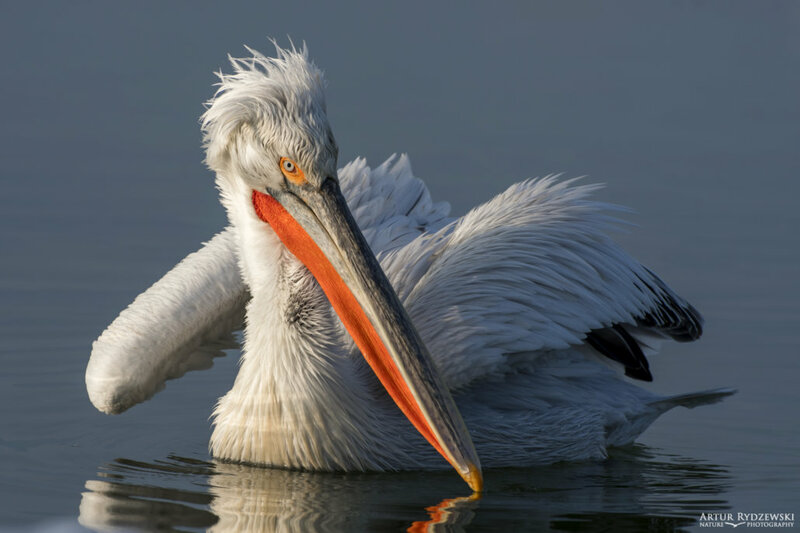 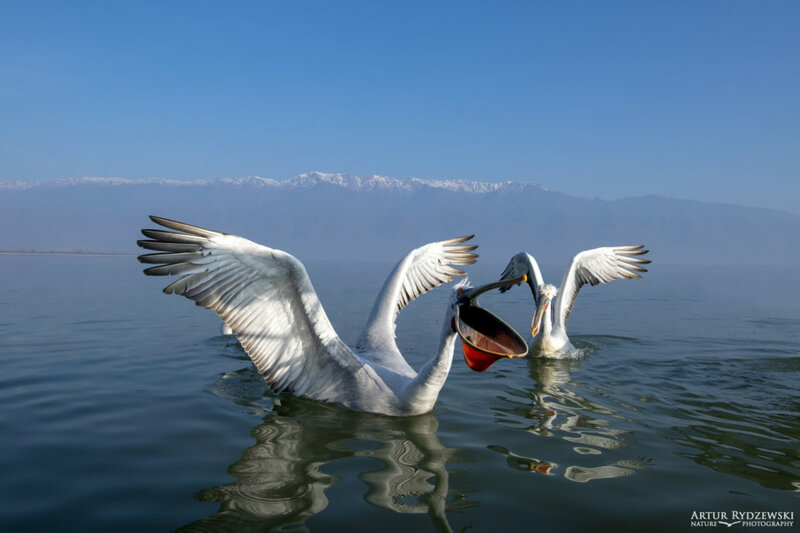 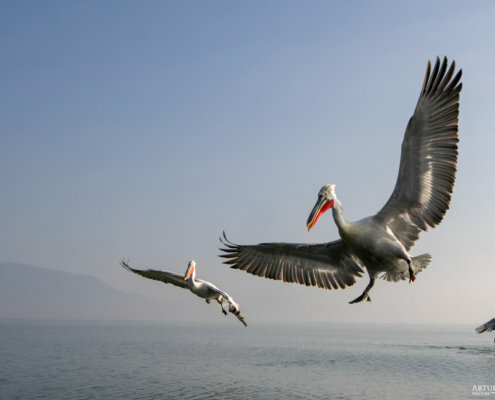 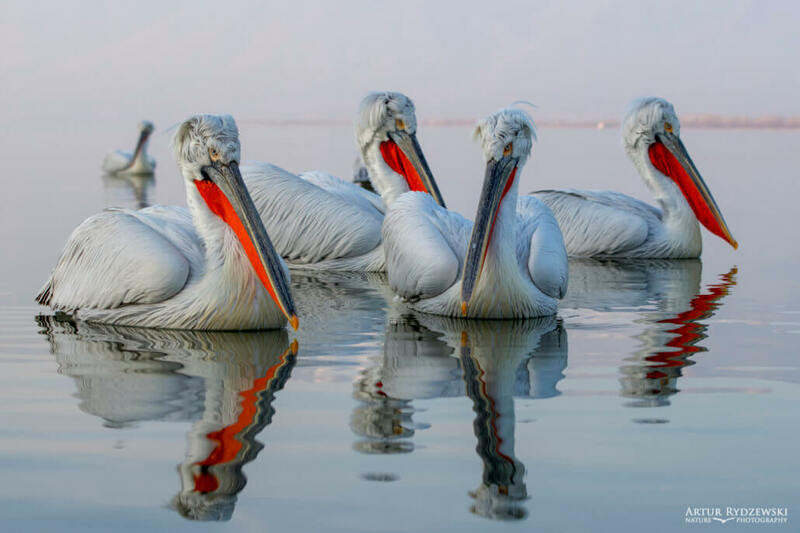 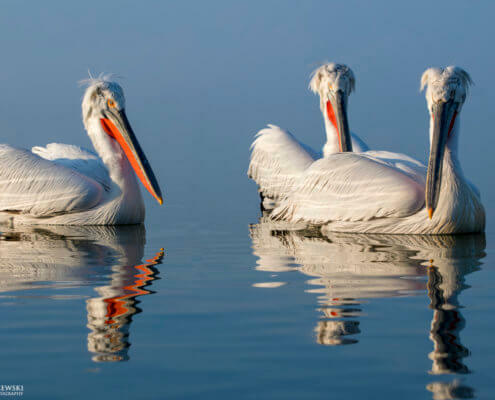 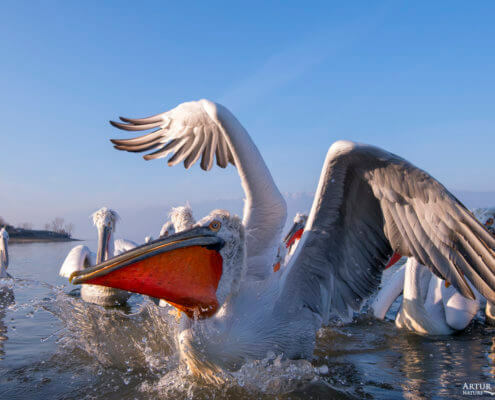 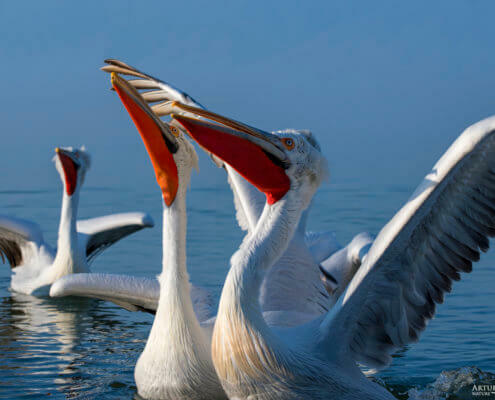 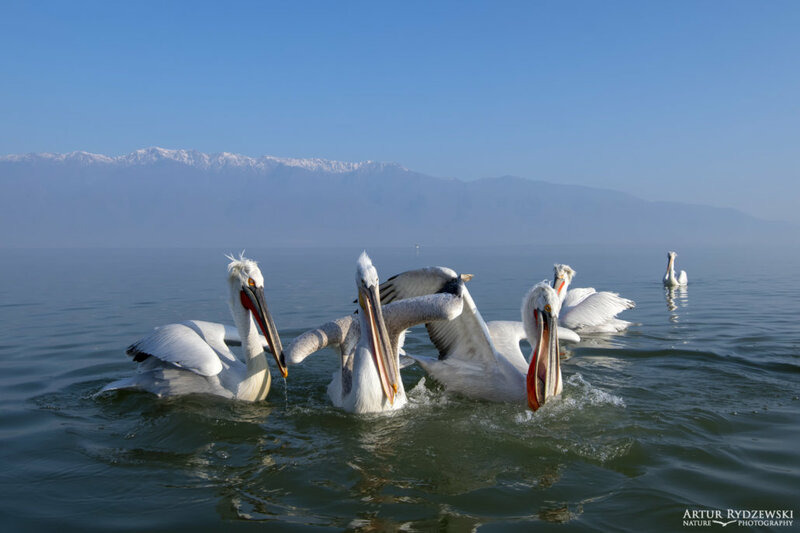 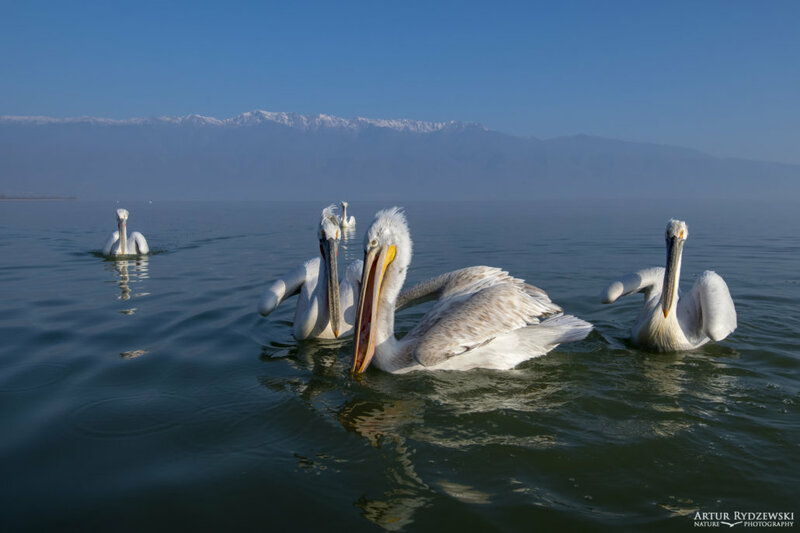 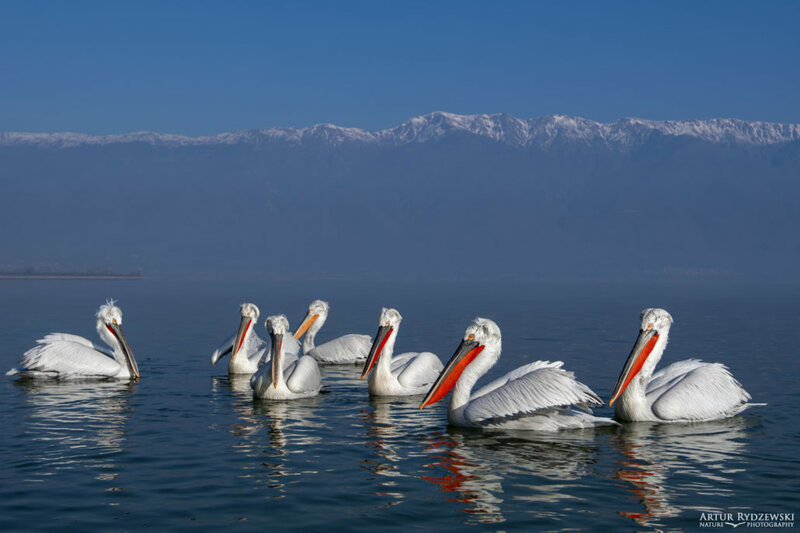 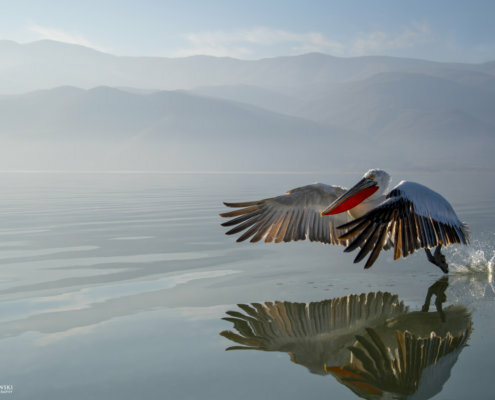 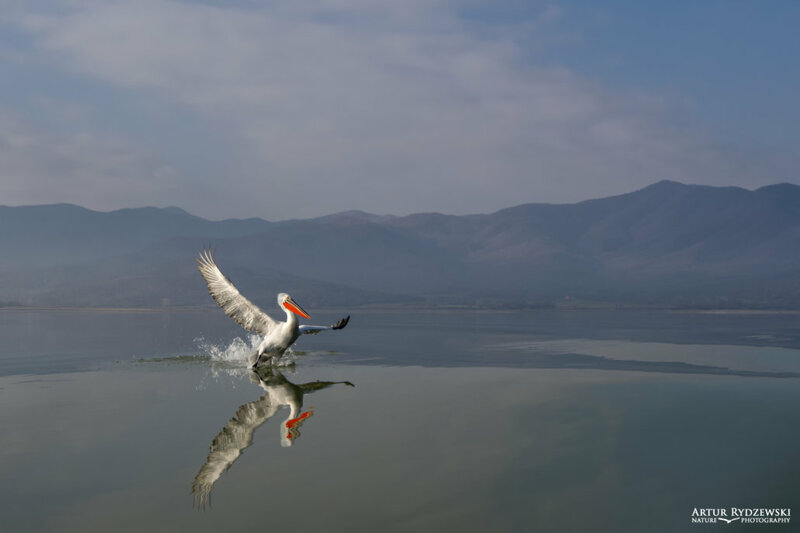 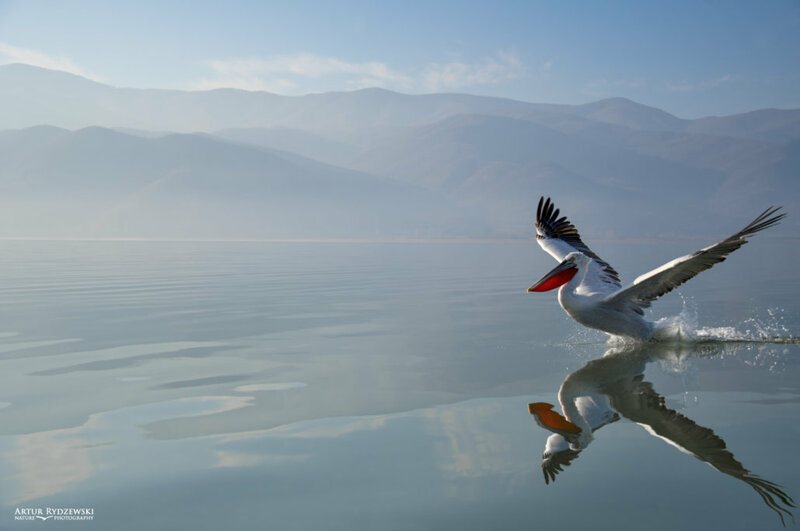 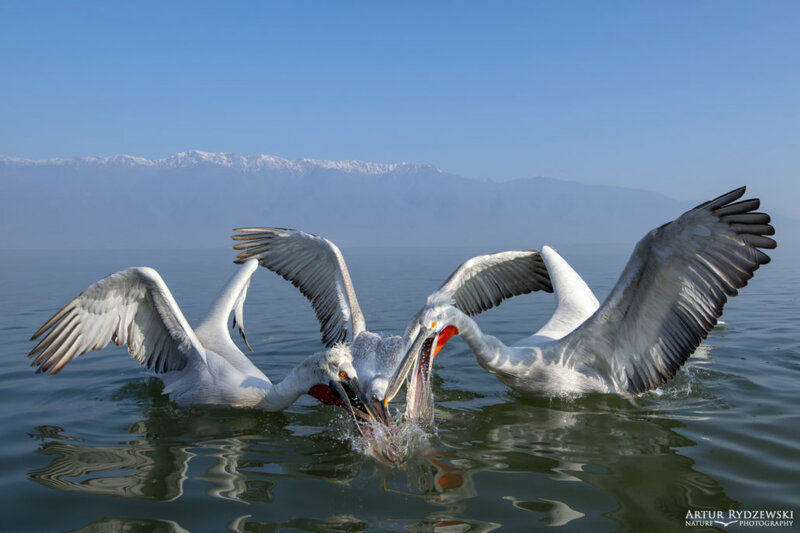 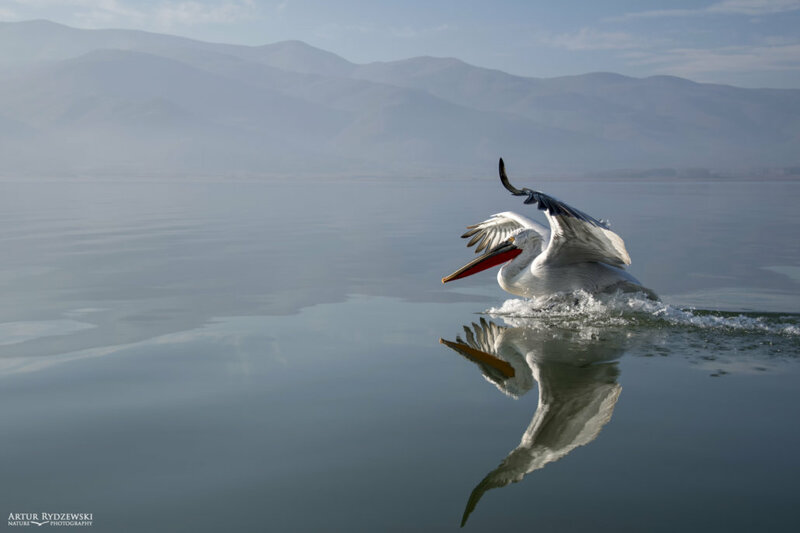 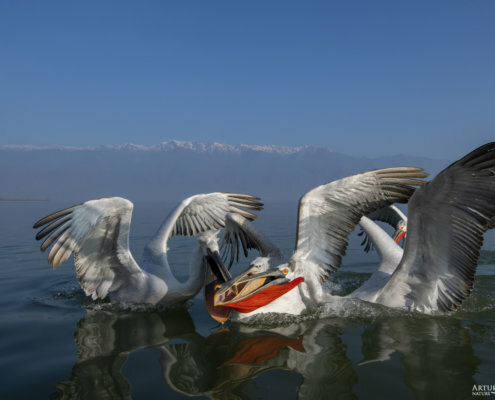 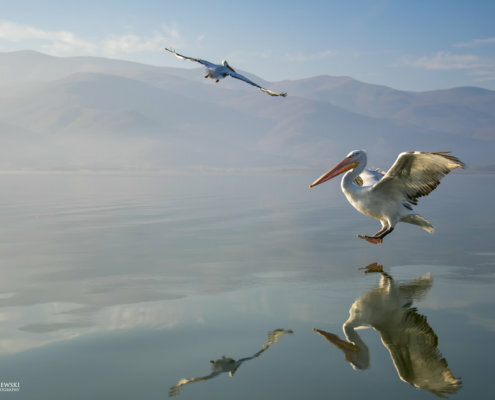 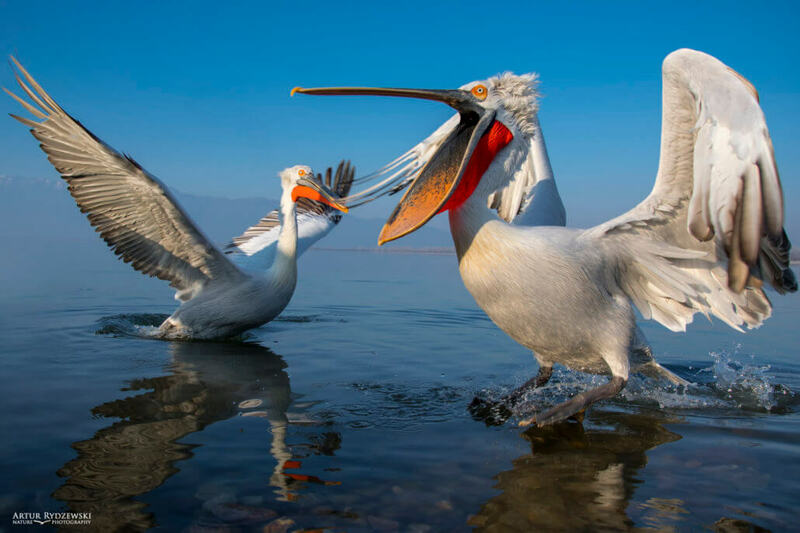 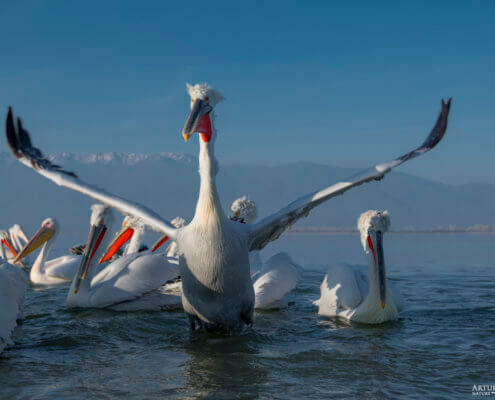 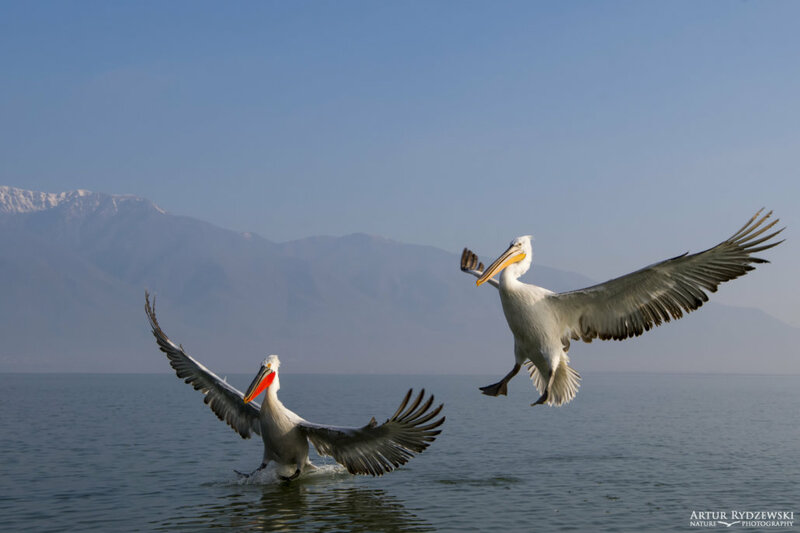 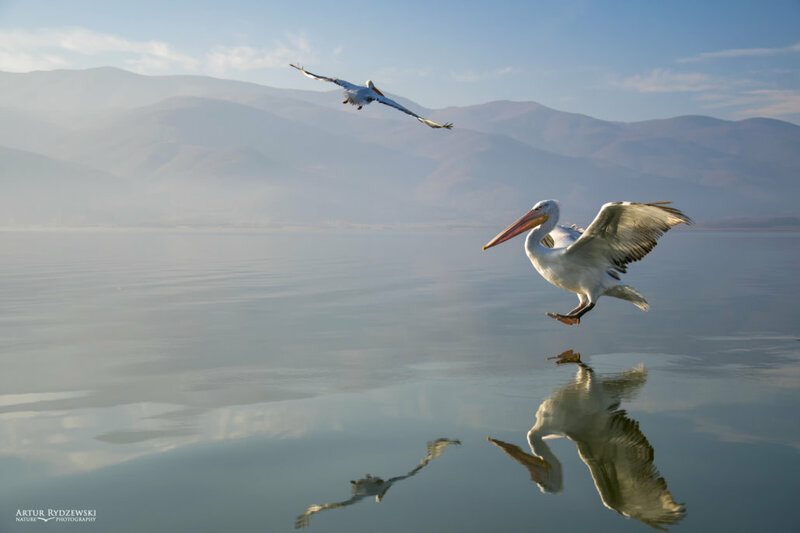 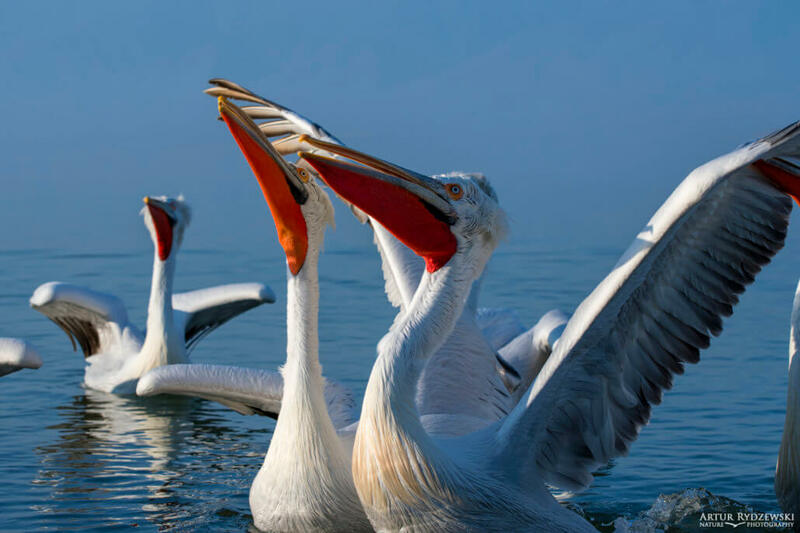 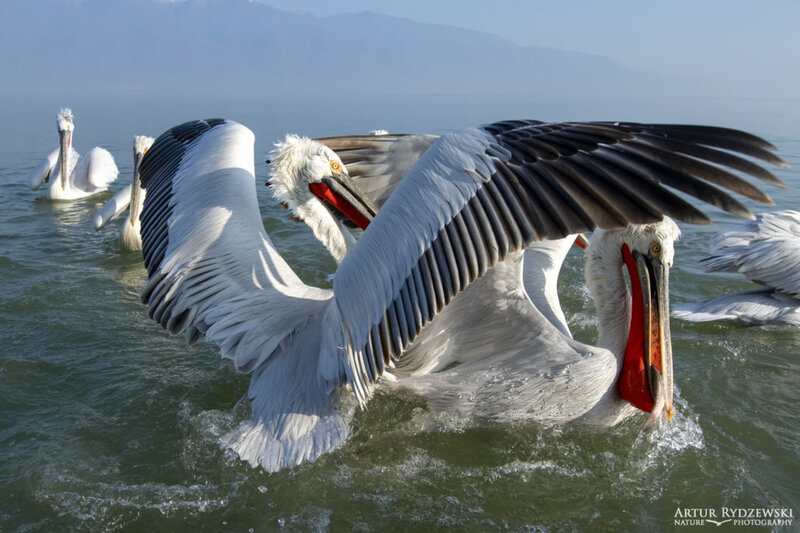 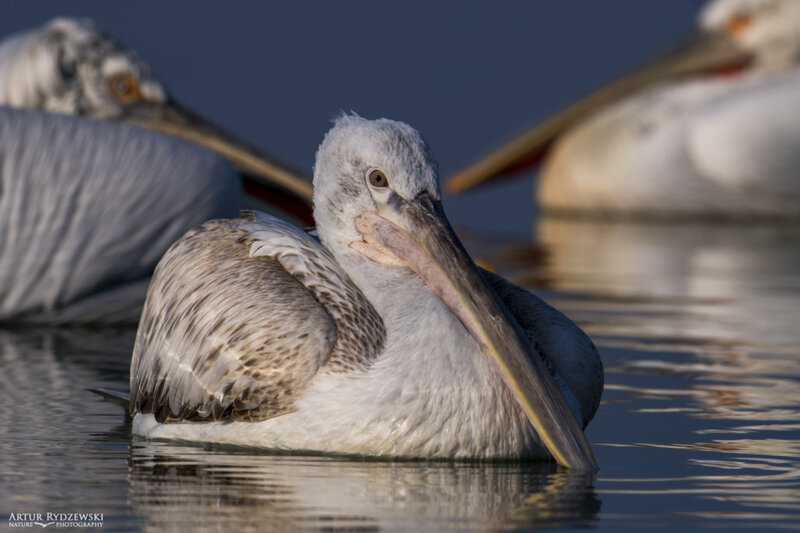 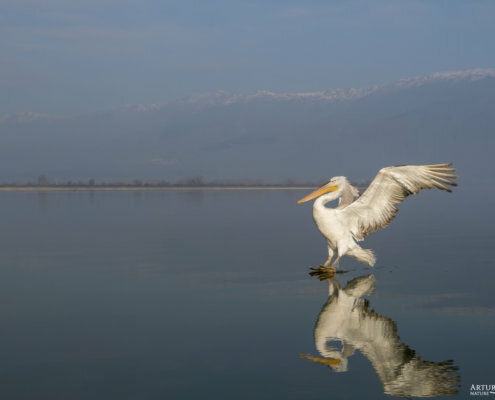 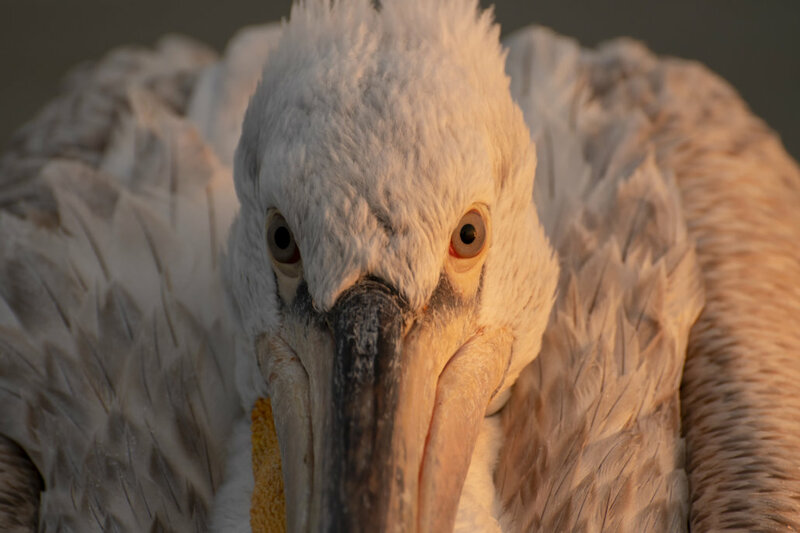 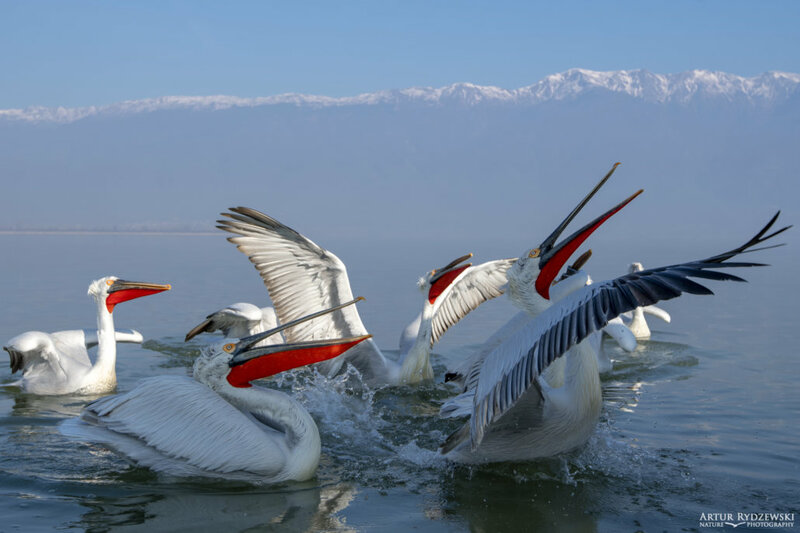 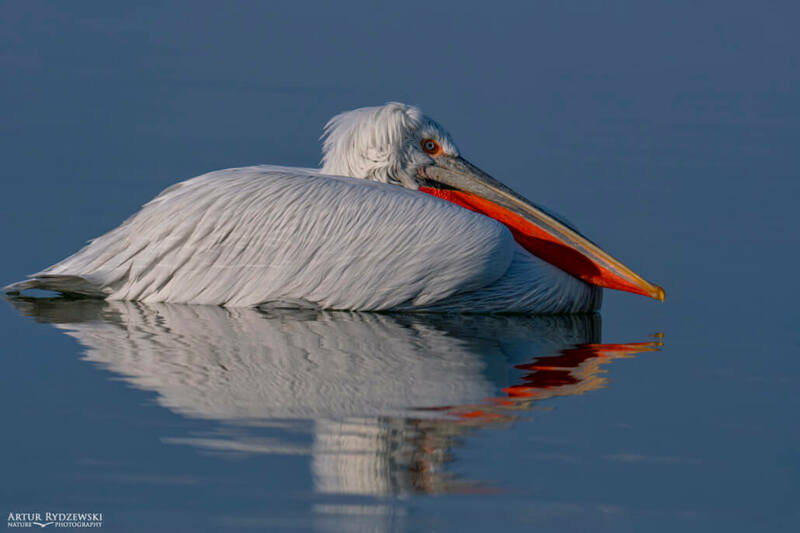 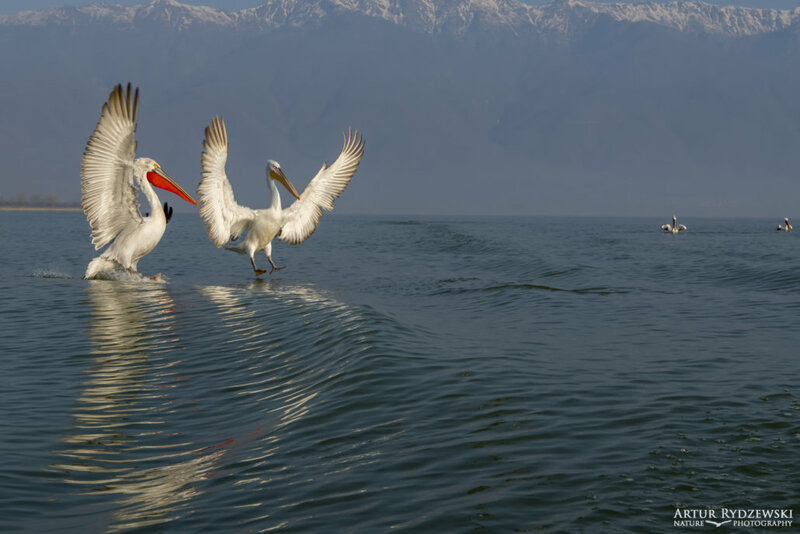 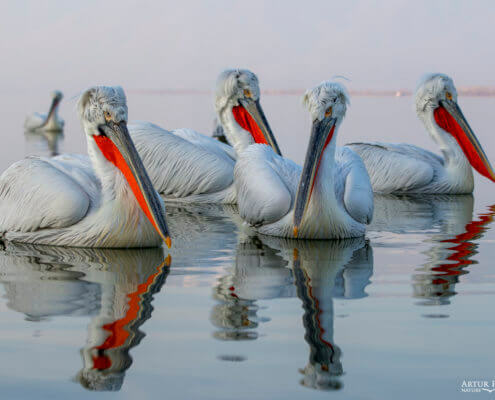 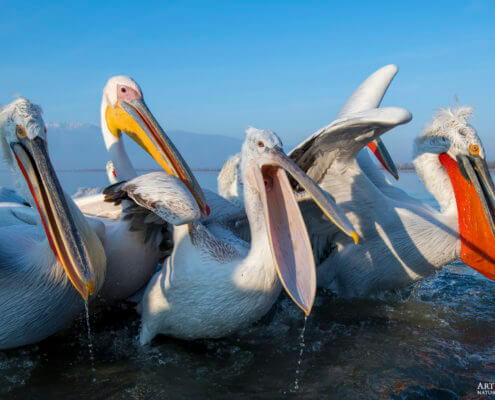 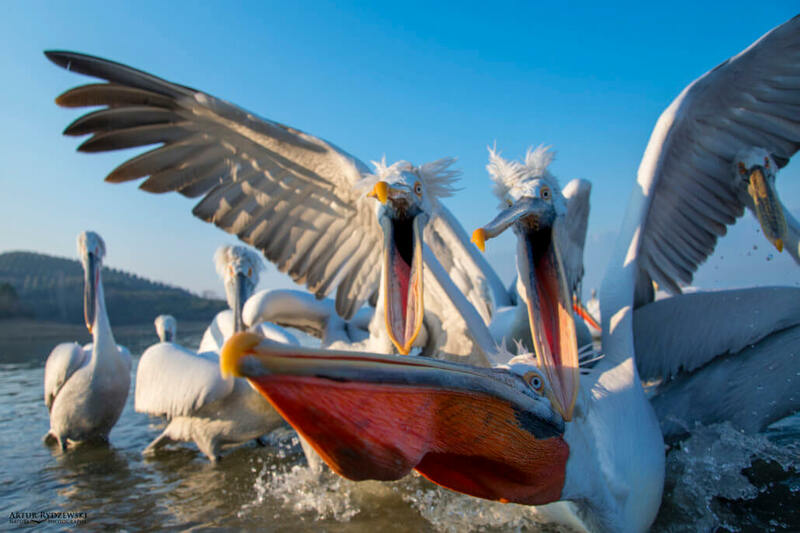 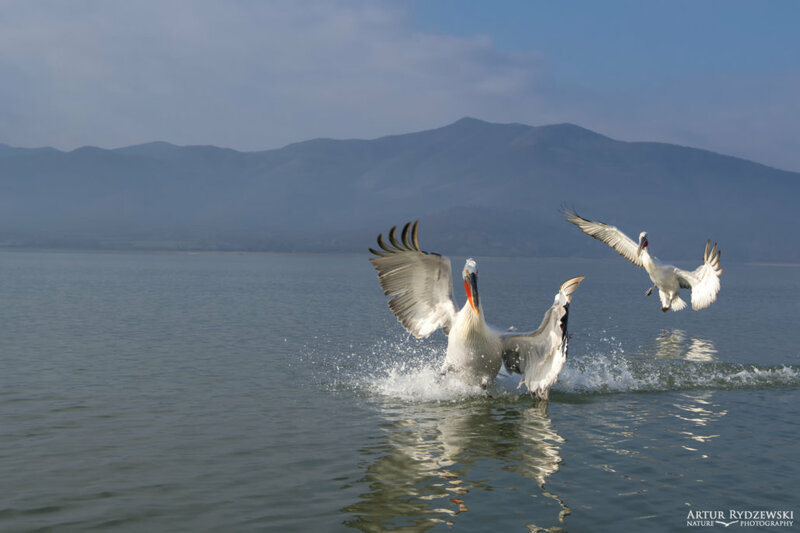 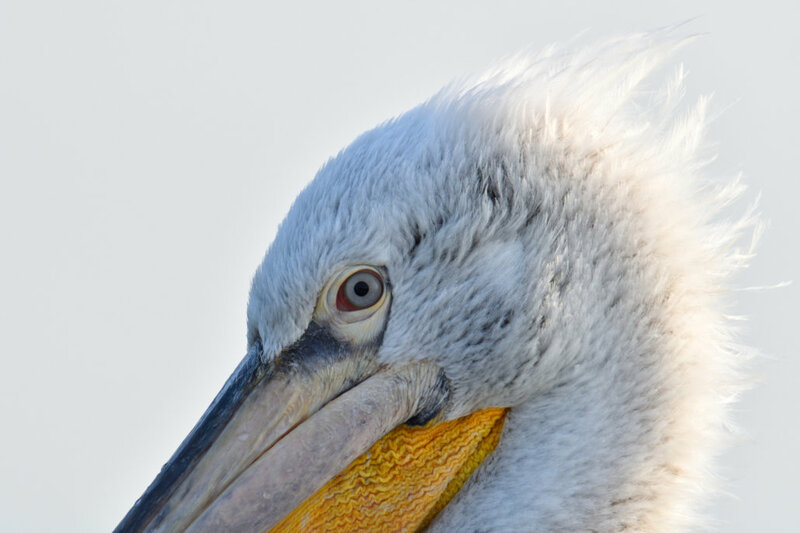 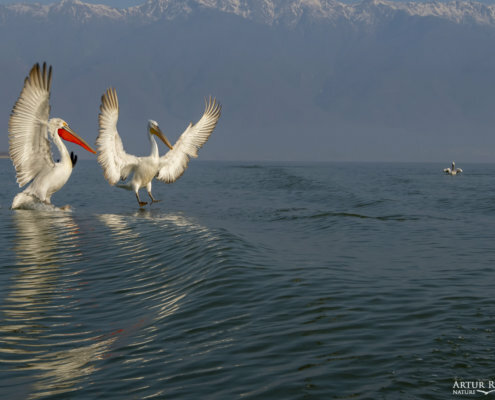 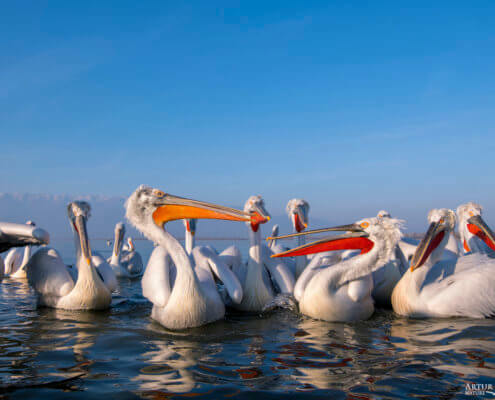 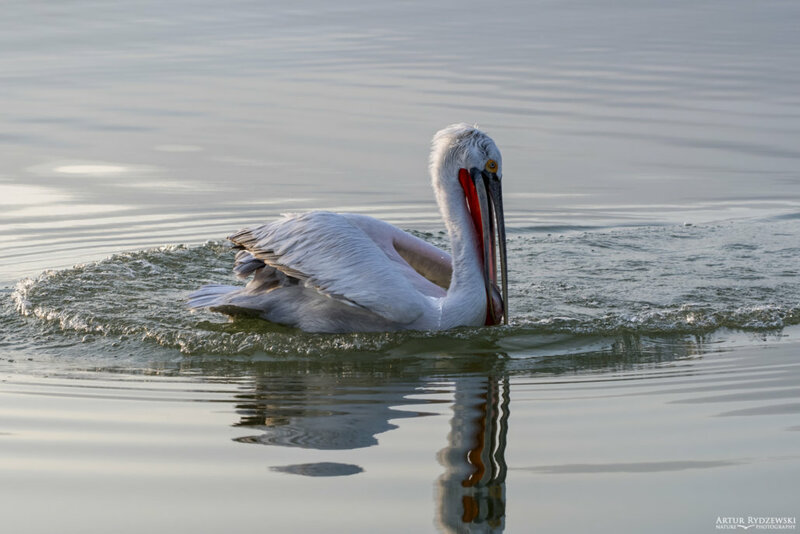 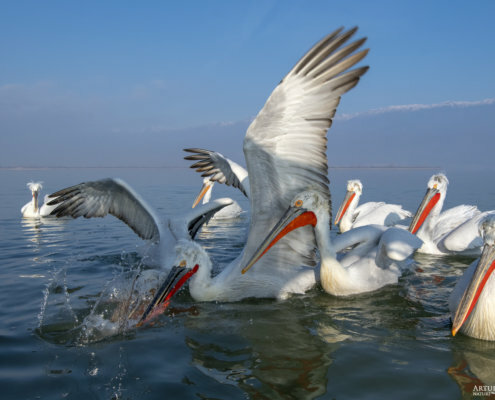 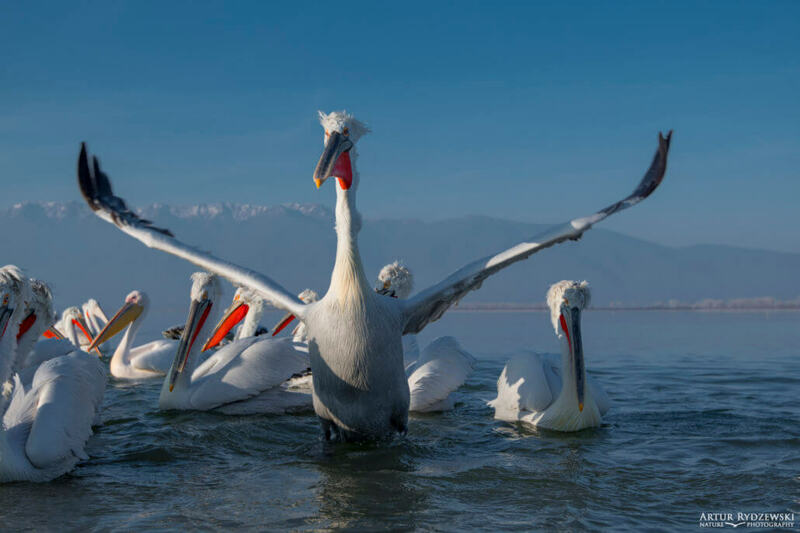 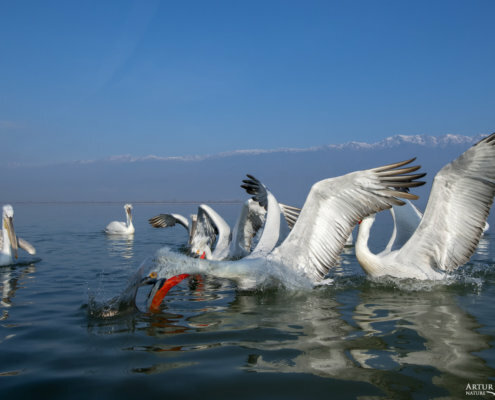 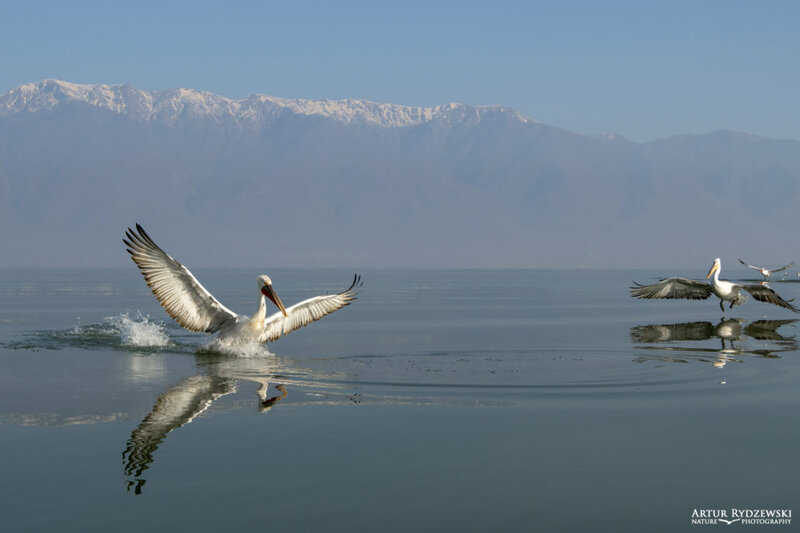 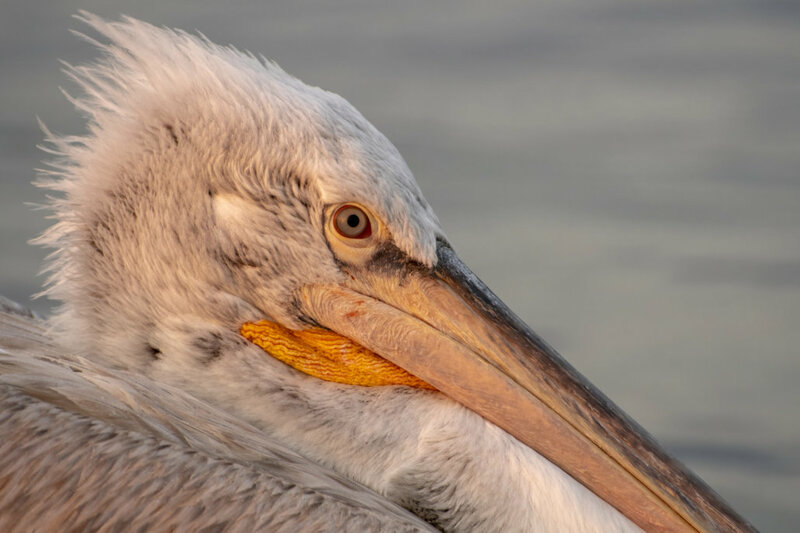 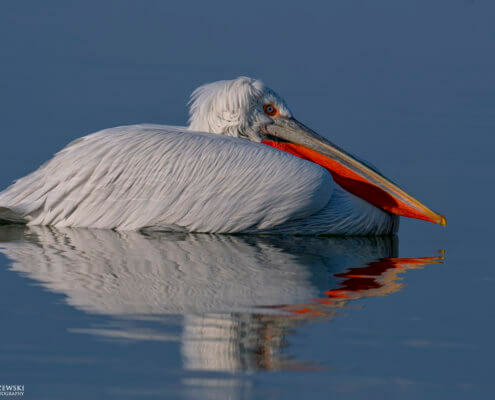 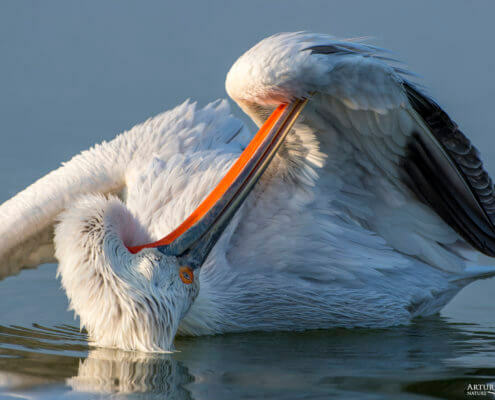 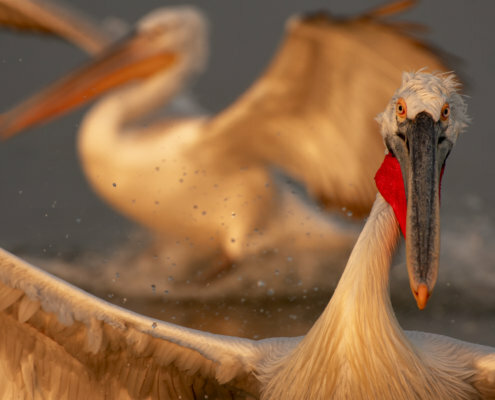 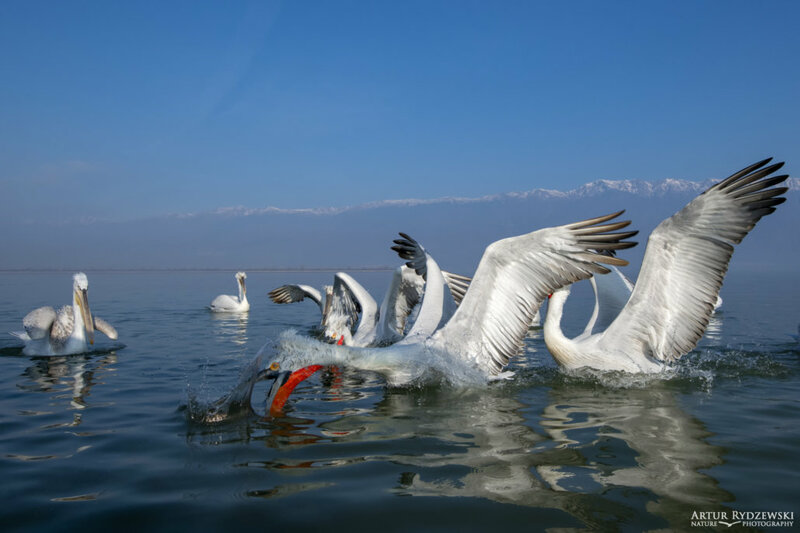 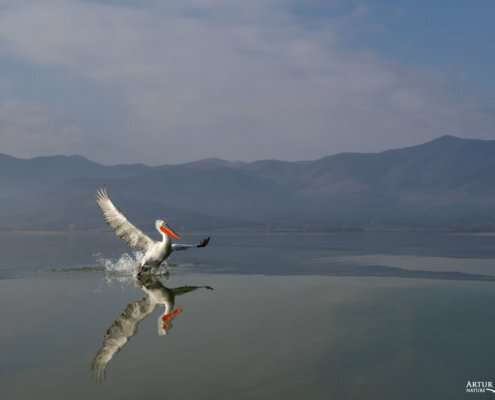 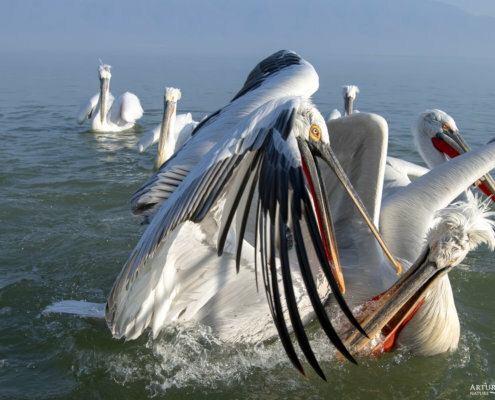 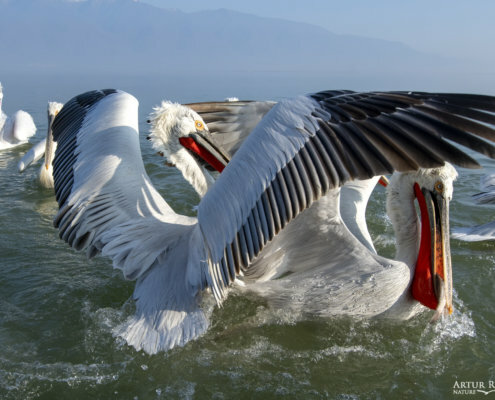 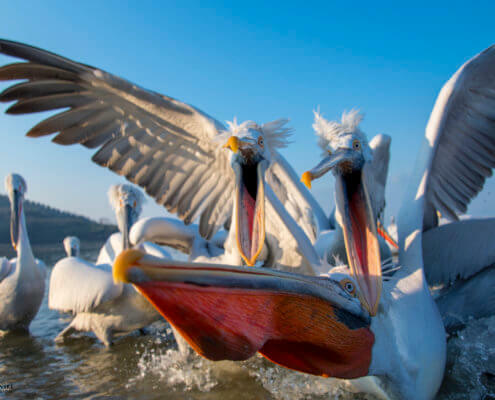 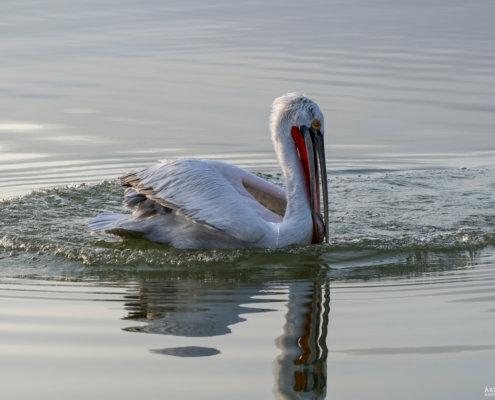 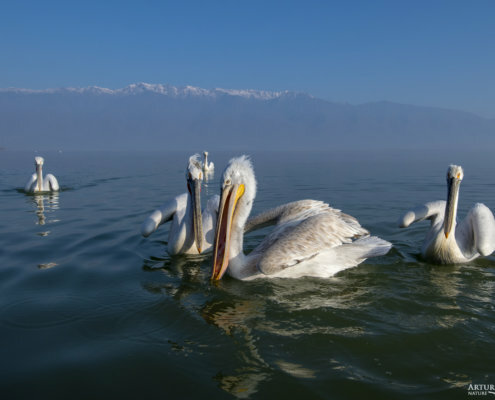 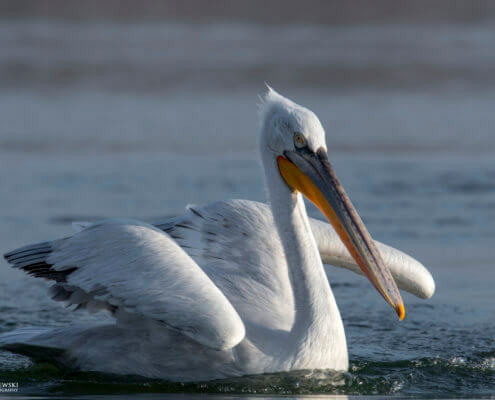 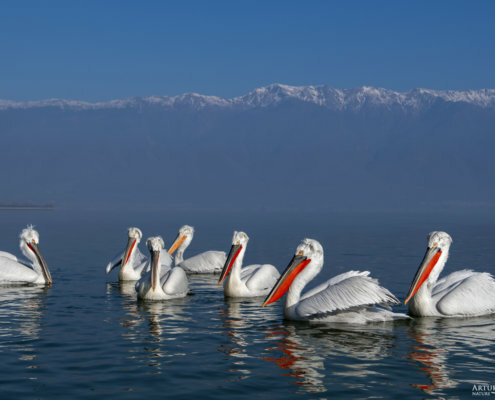 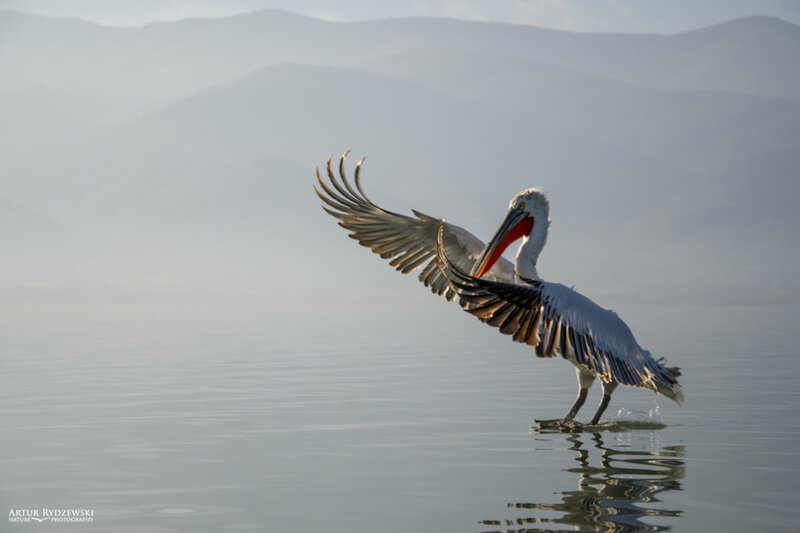 The photo set presents DALMATIAN PELICANS. 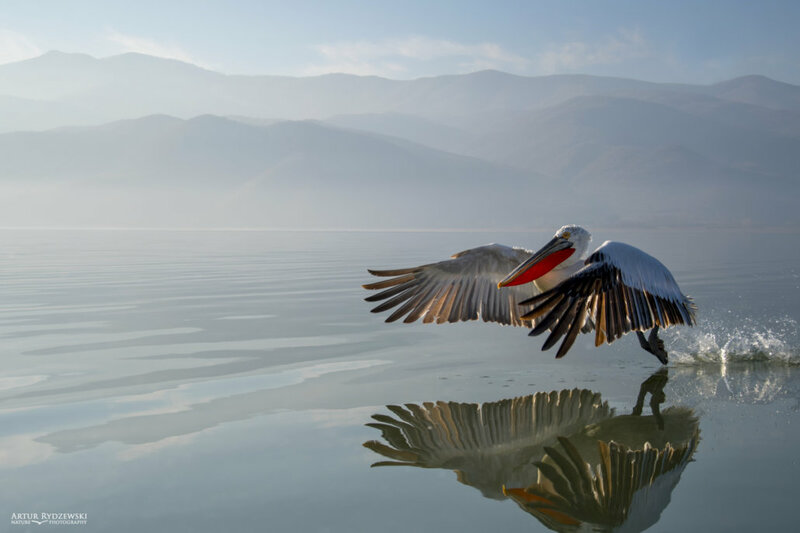 The pictures were taken in January 2018 in the north of Greece. 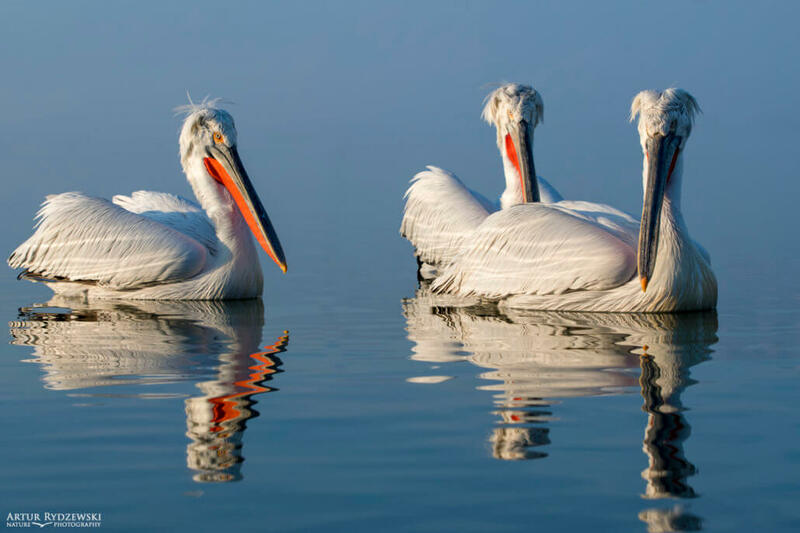 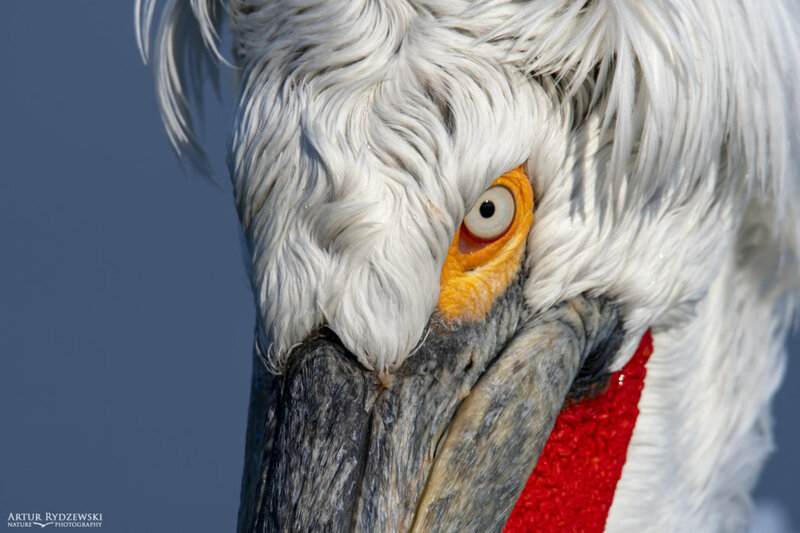 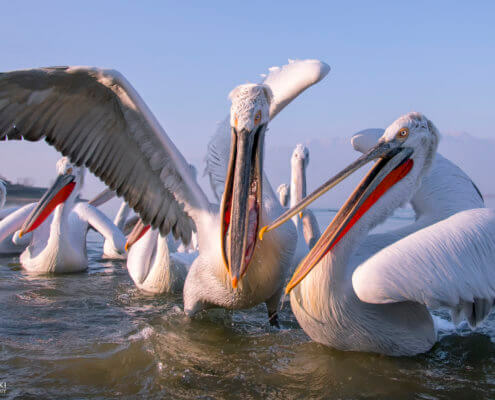 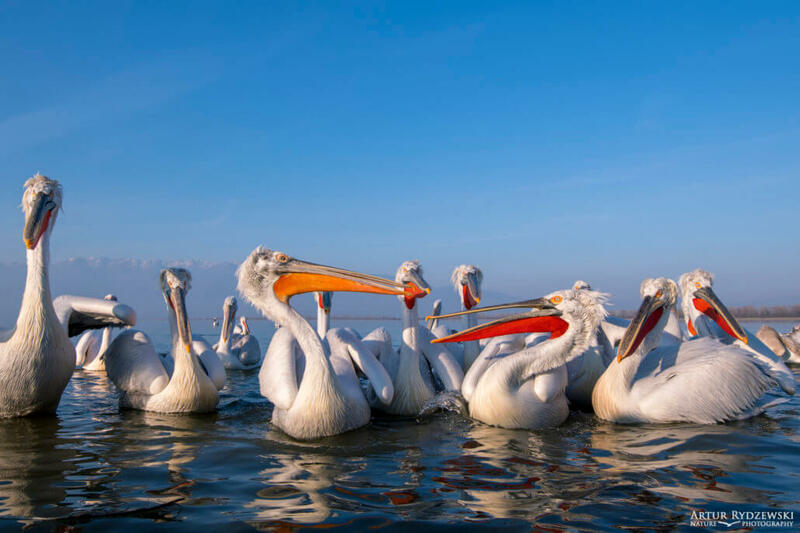 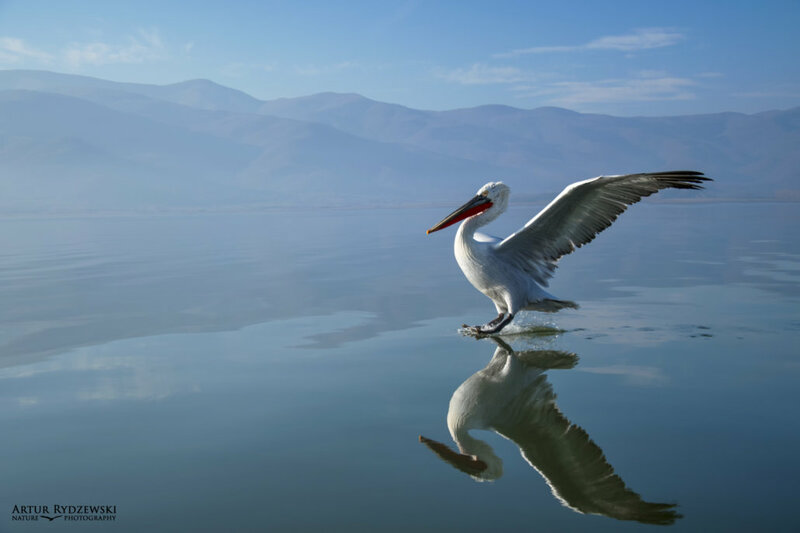 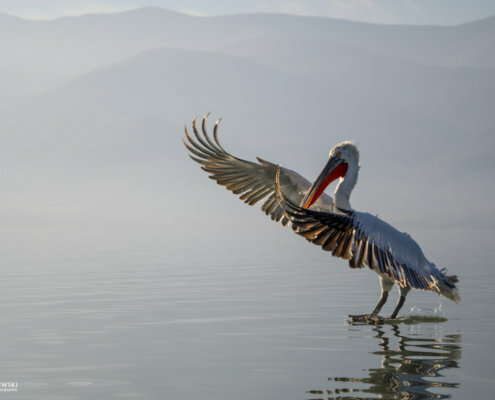 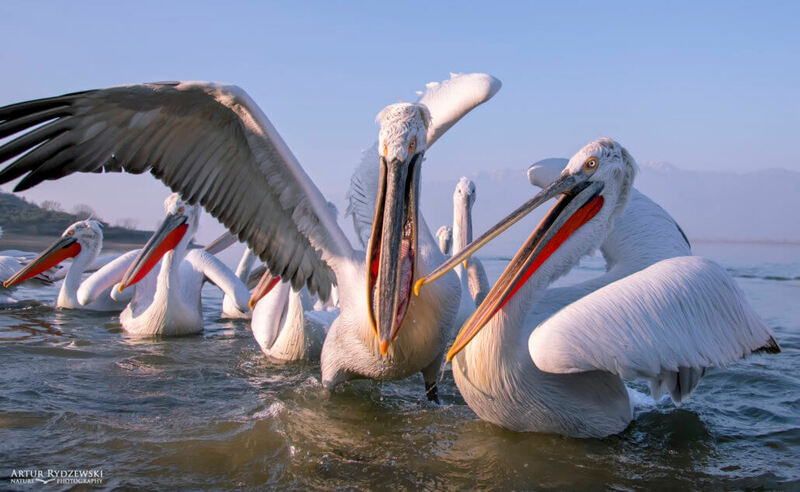 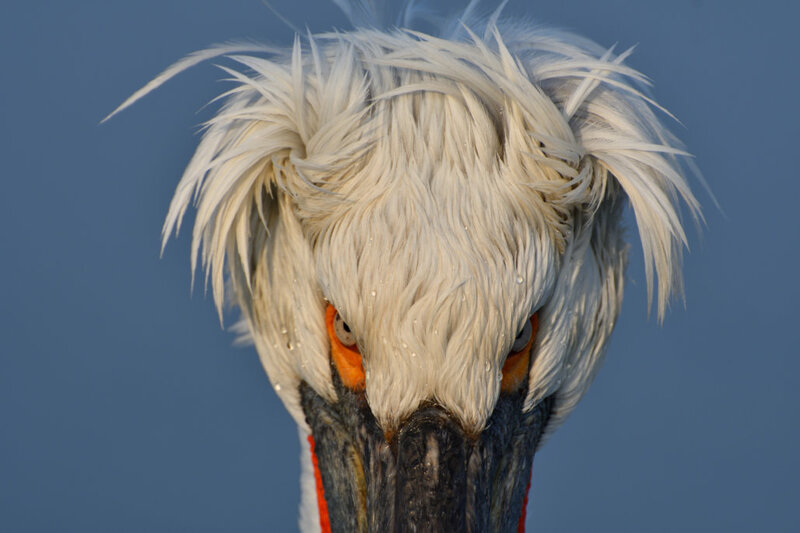 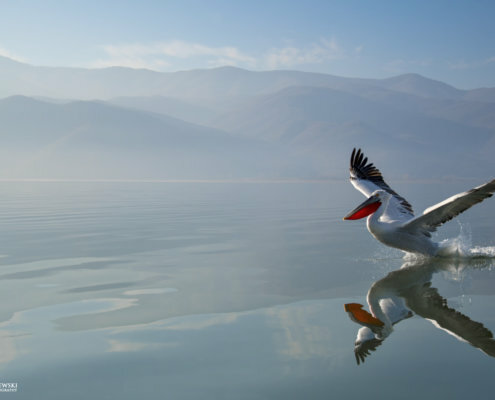 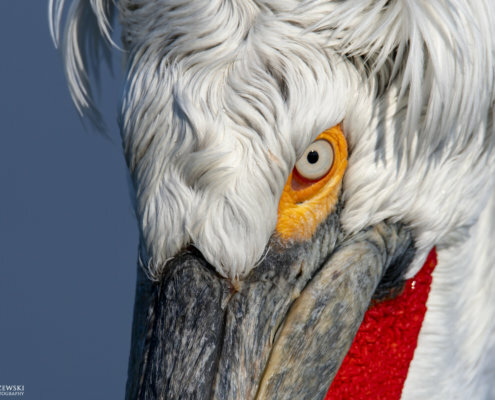 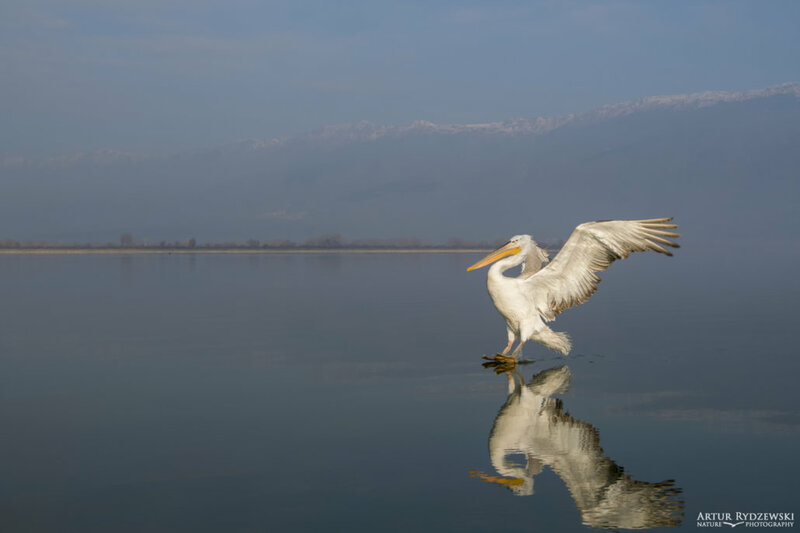 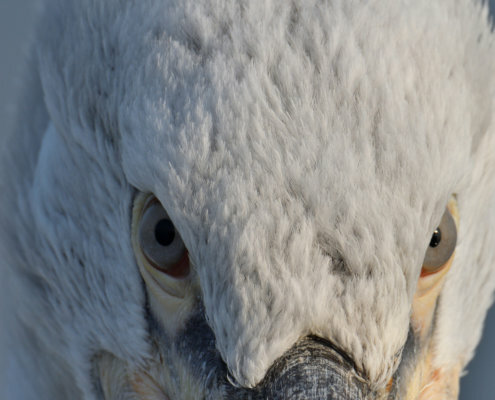 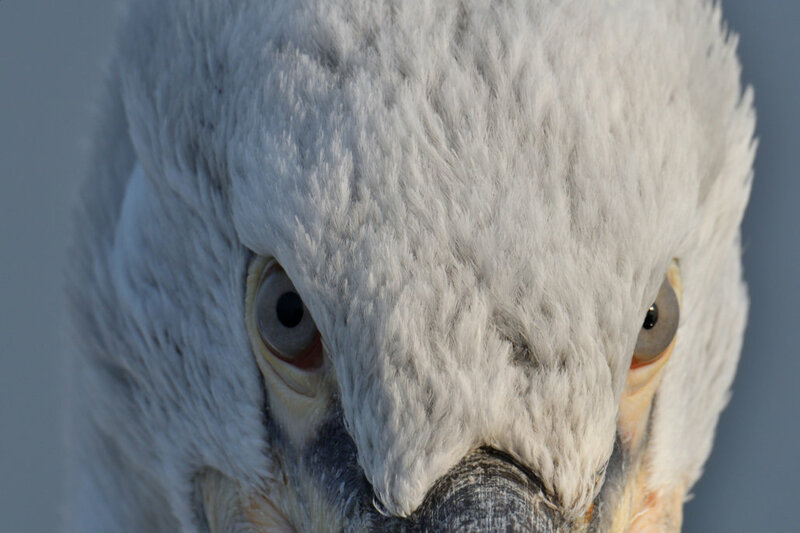 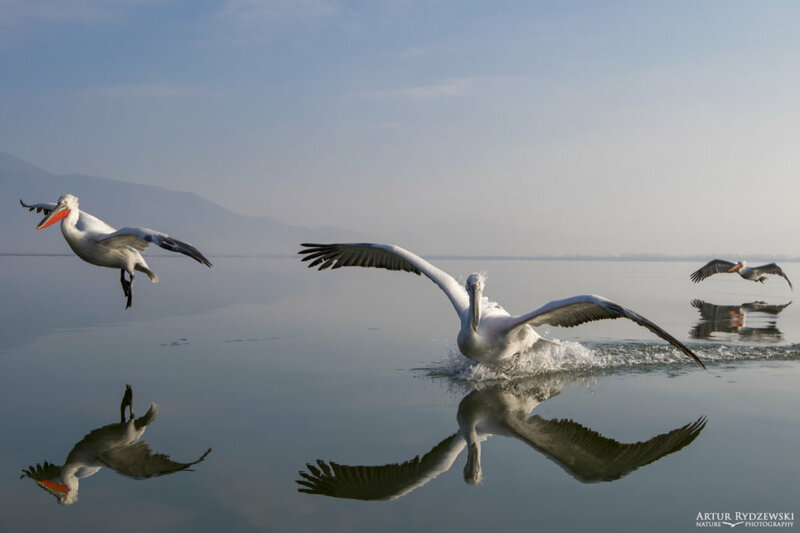 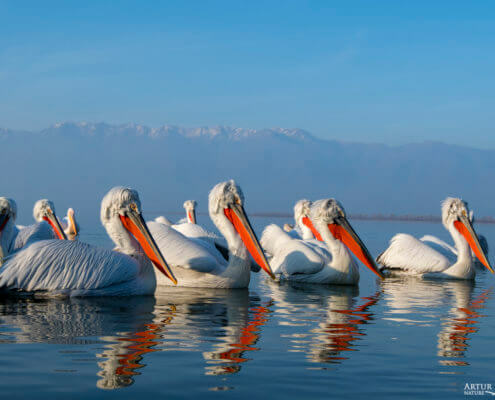 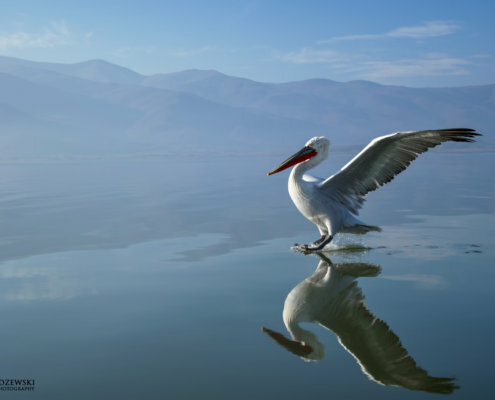 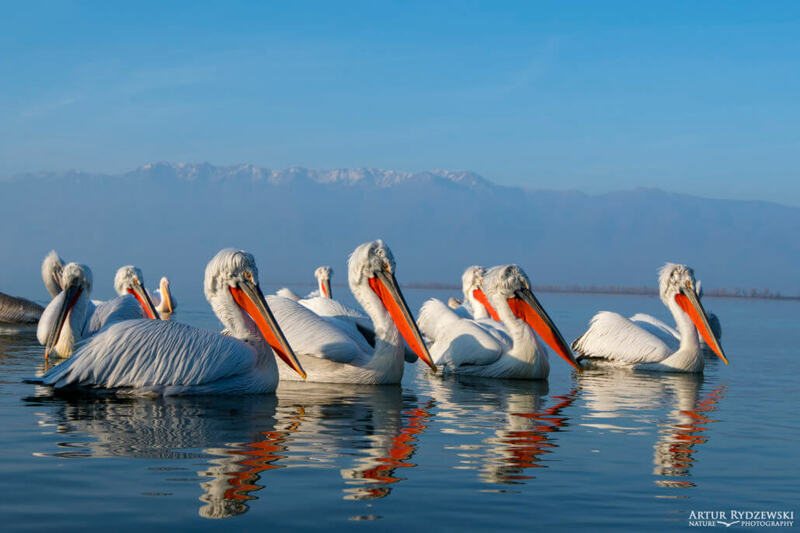 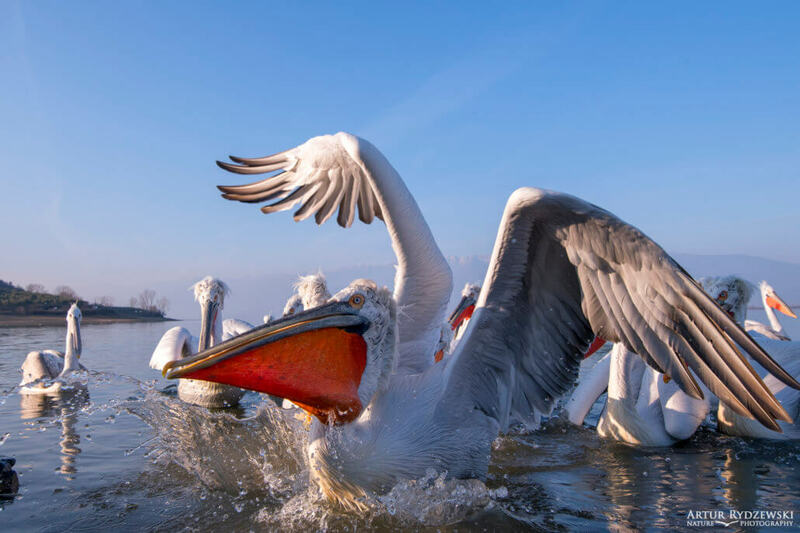 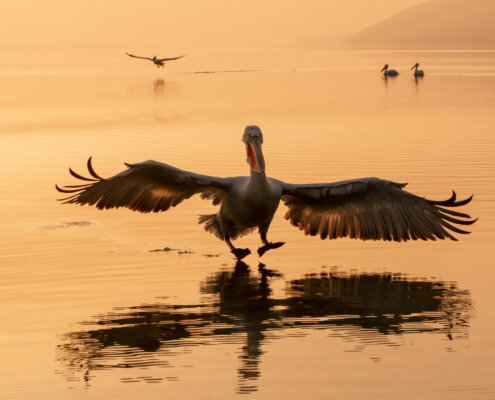 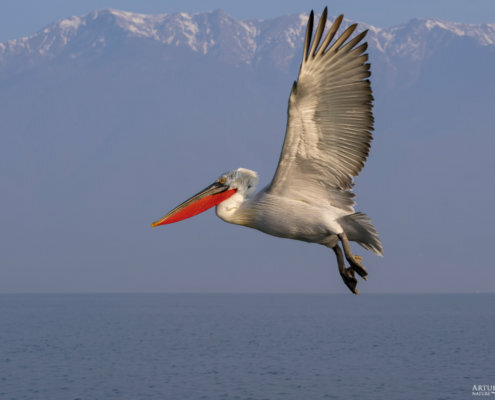 It is the biggest dalmatian pelicans colony in Europe and third in the world. 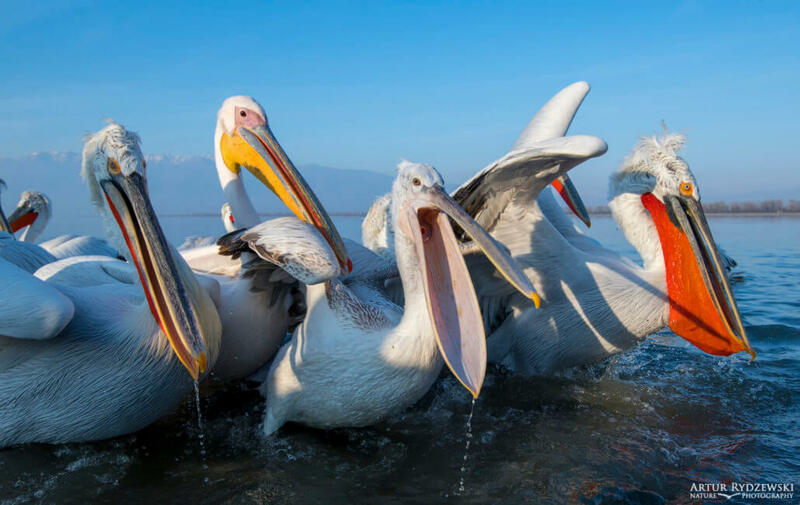 It took four days to capture the beauty of these animals in its fullness. 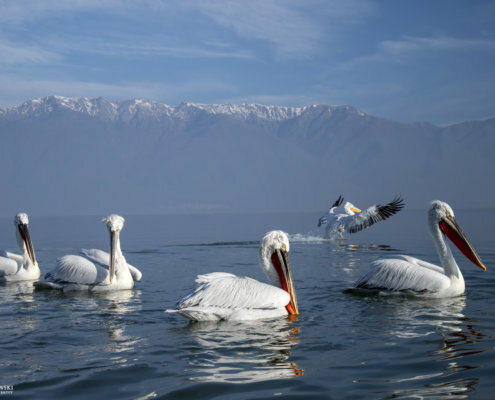 Each morning started with a trip by boat, which was followed by a series of pictures taken at the lake shore. 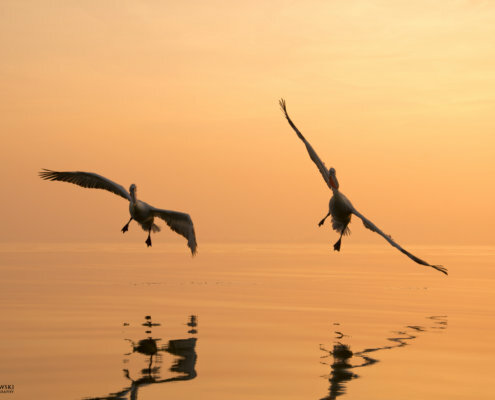 The sunrise and the sunset elicit the richness of the stunning nature which is showed in the photos. 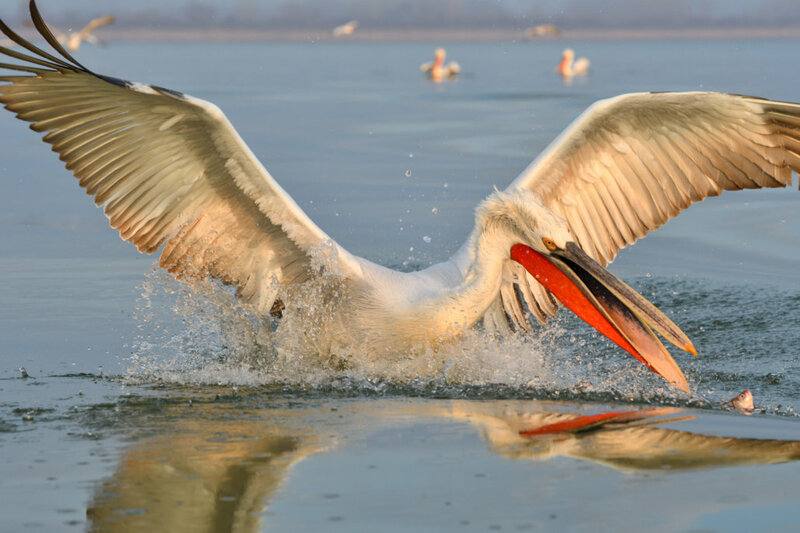 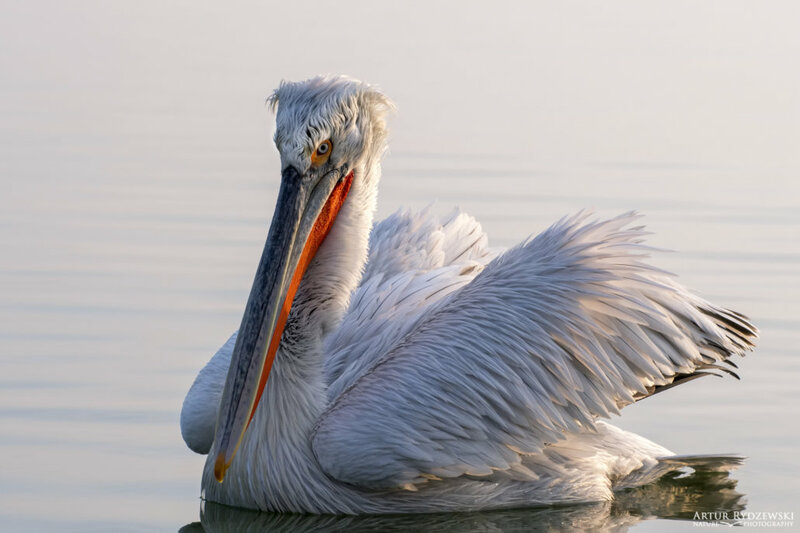 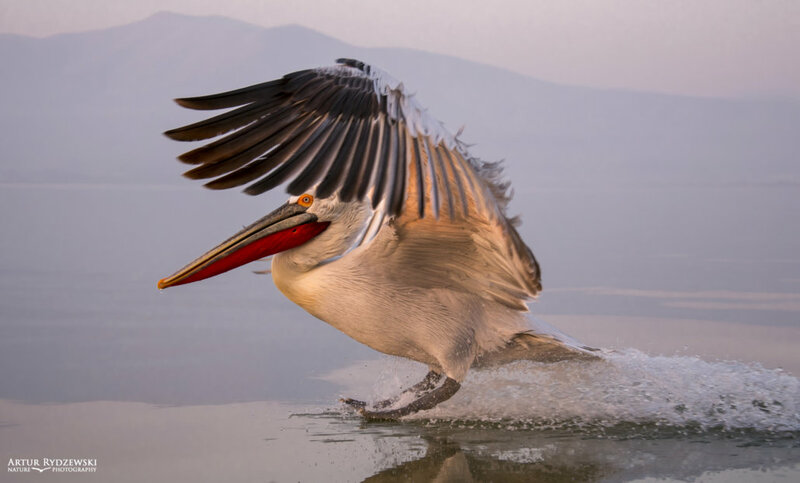 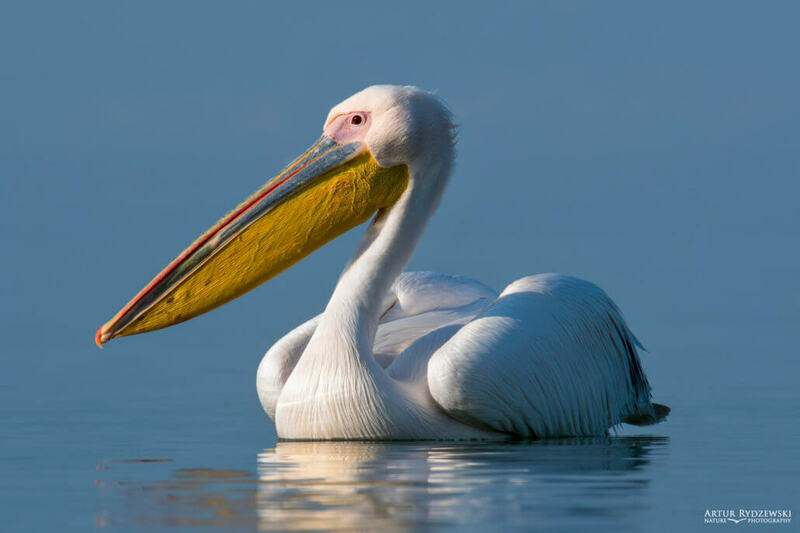 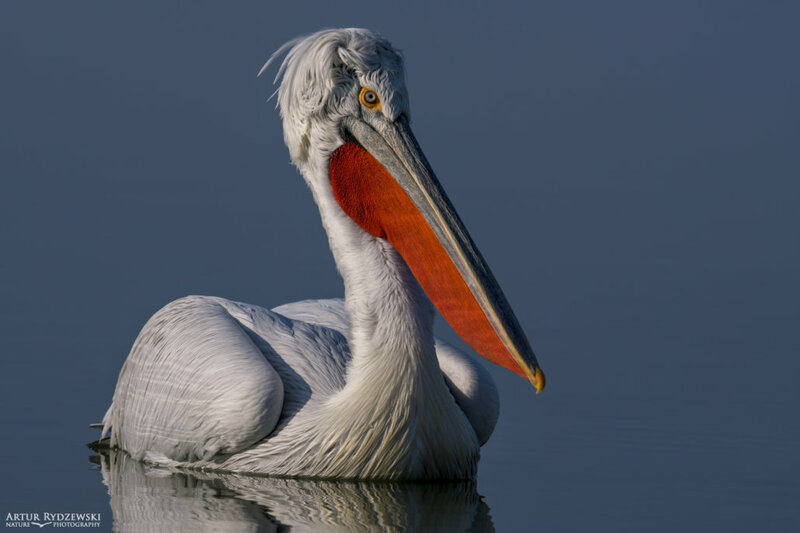 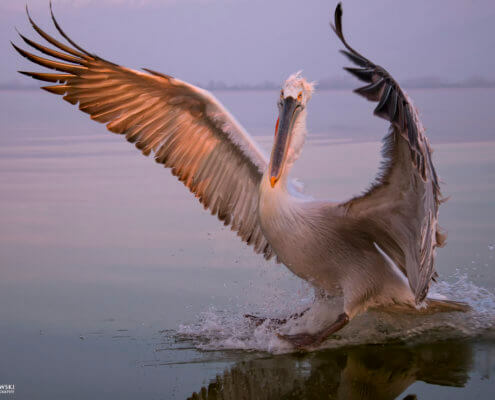 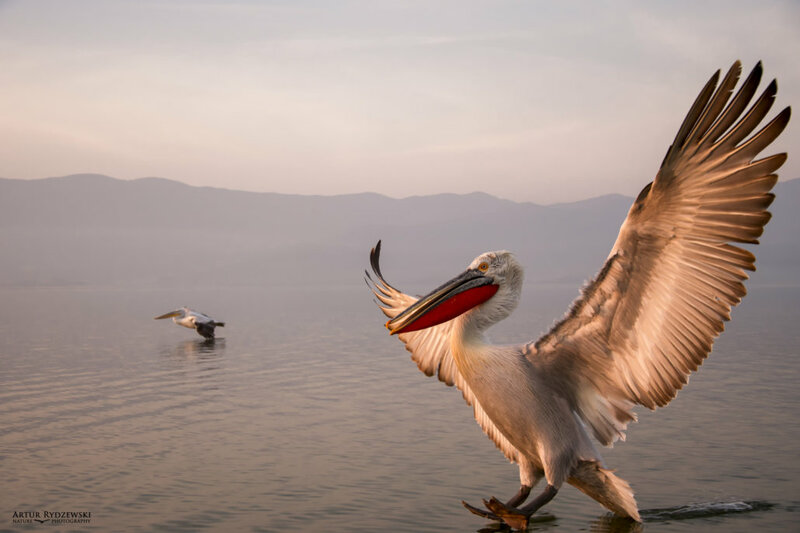 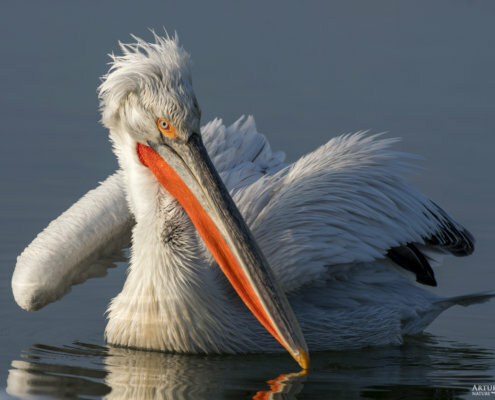 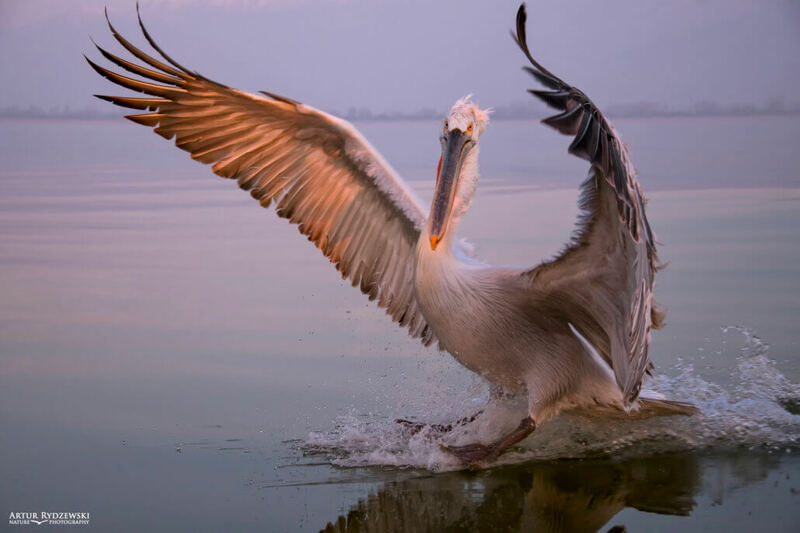 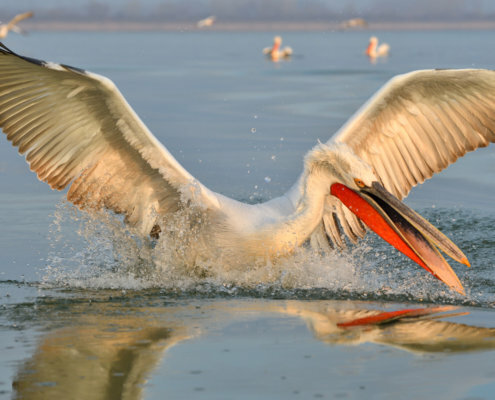 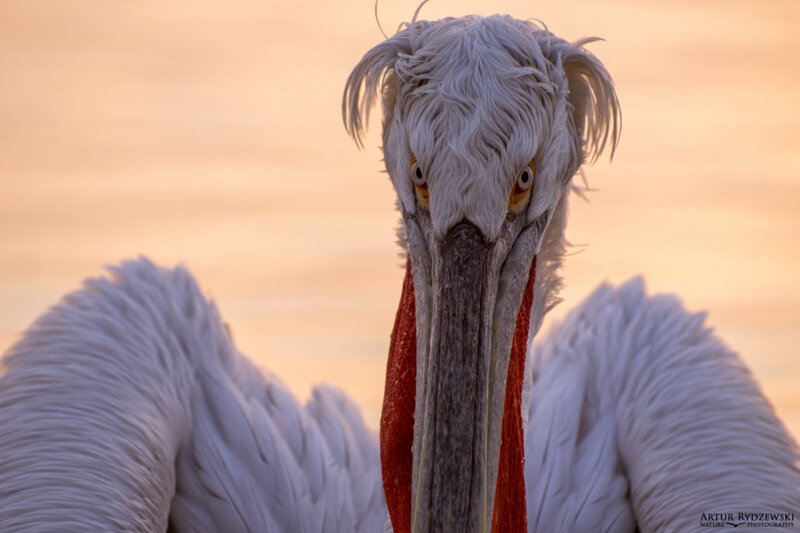 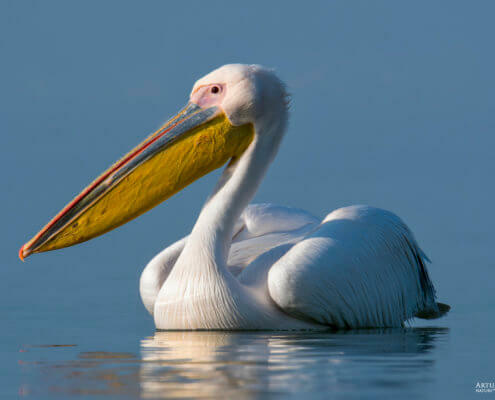 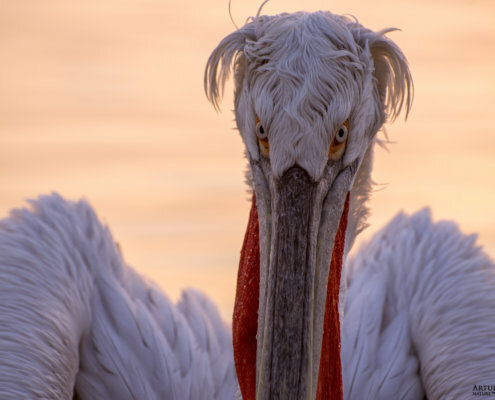 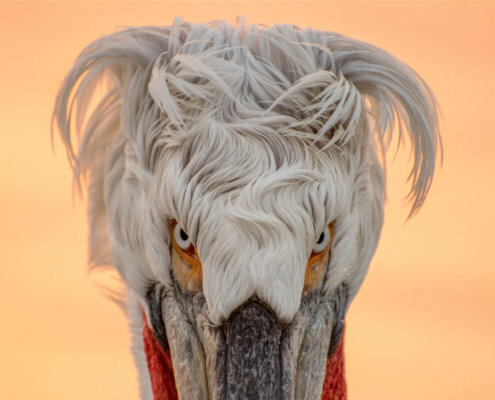 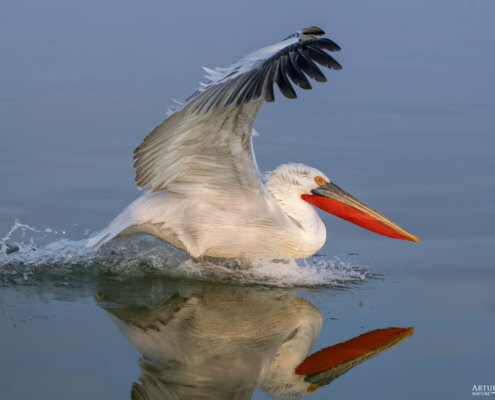 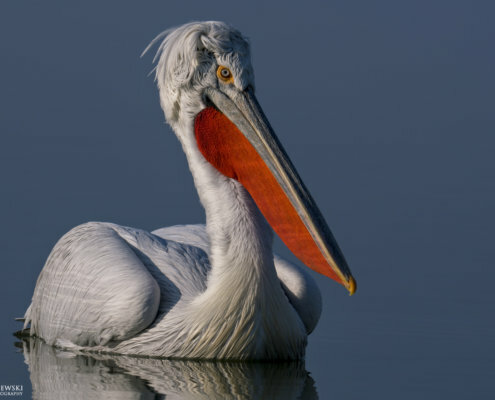 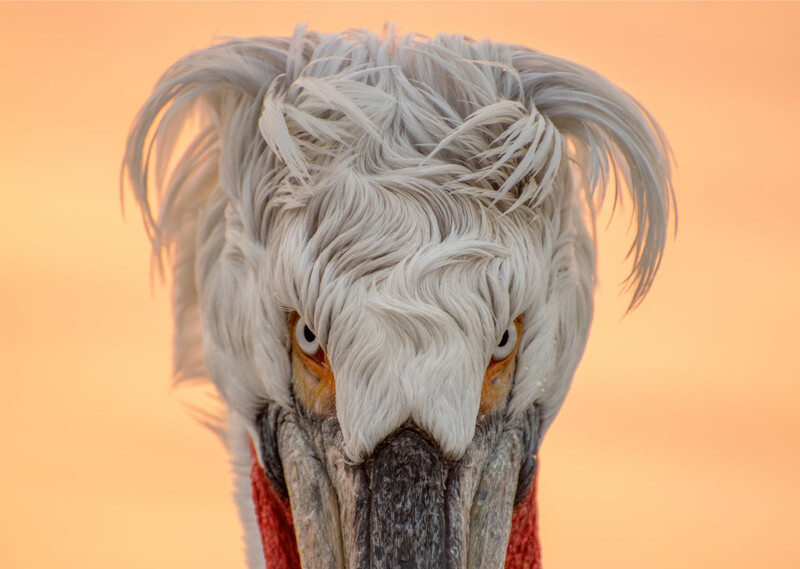 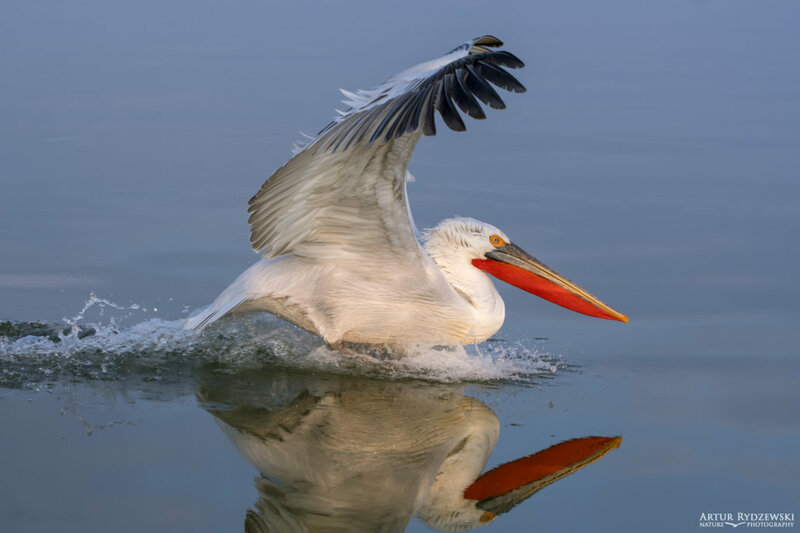 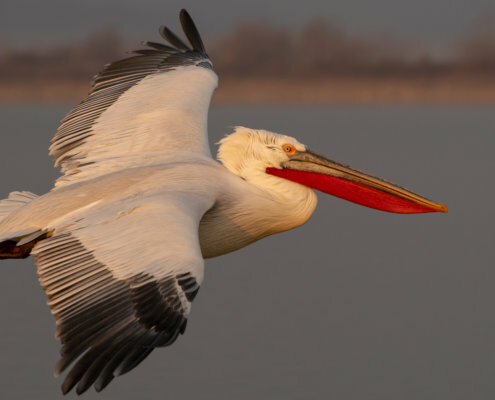 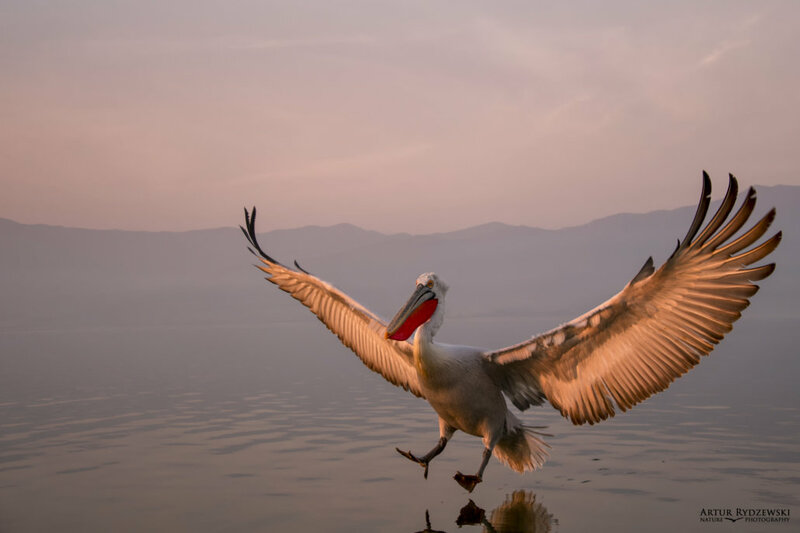 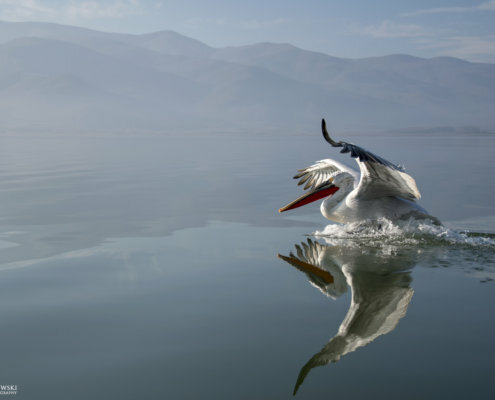 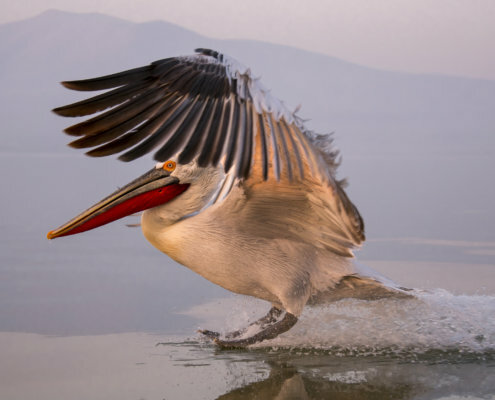 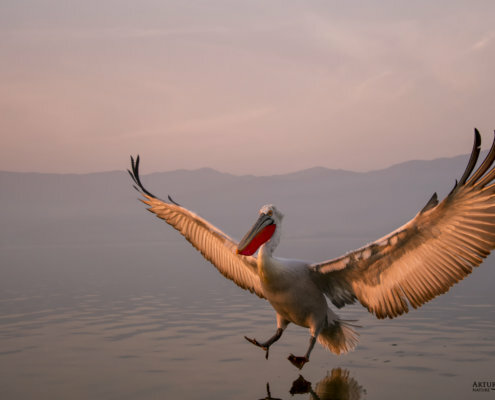 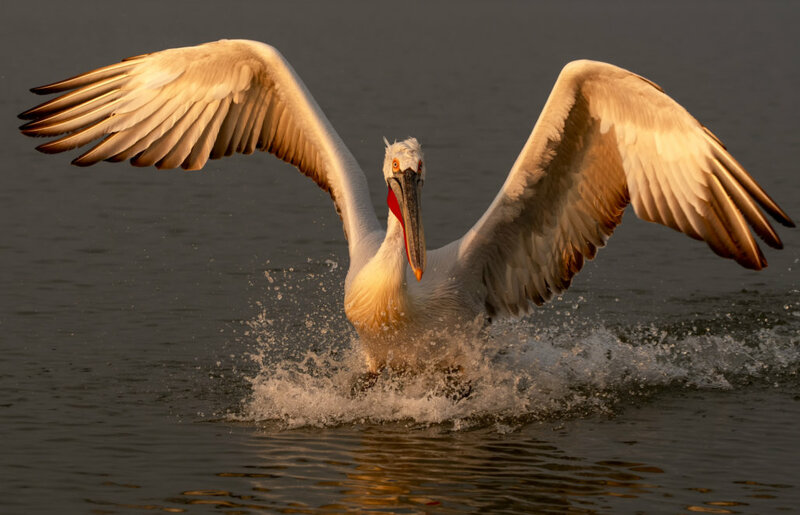 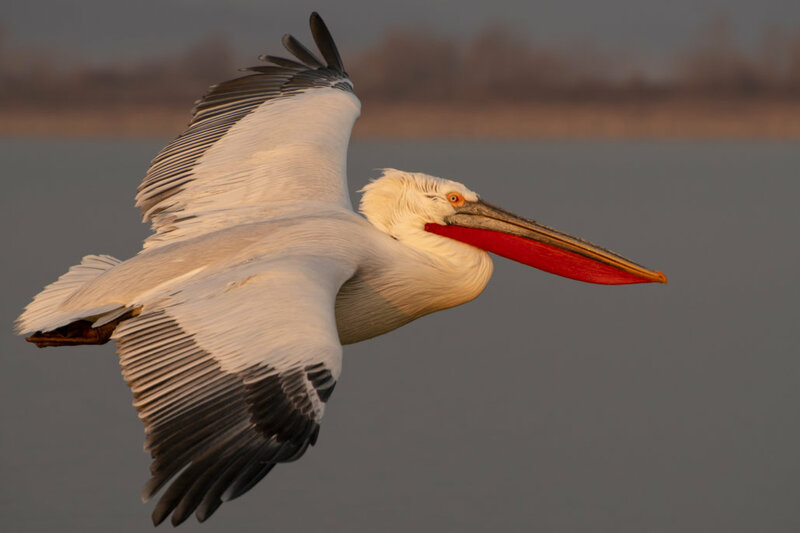 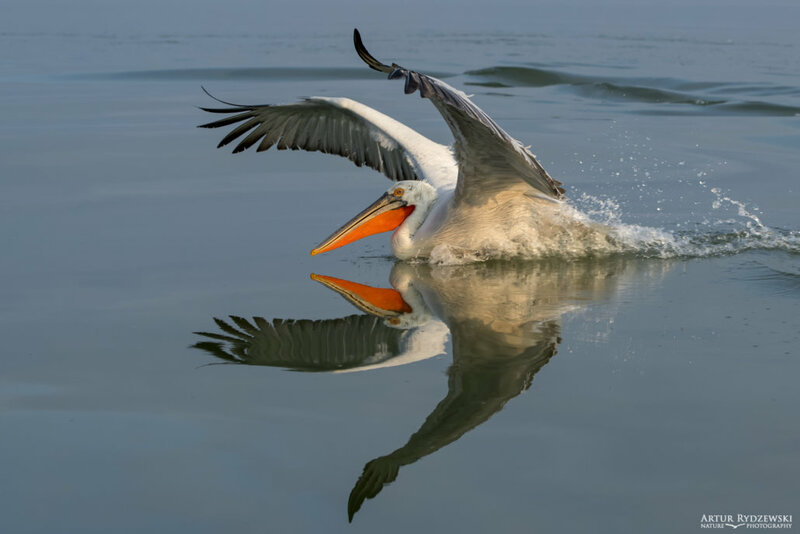 The Dalmatian pelican (Pelecanus crispus) is a massive member of the pelican family and the world’s largest freshwater bird. 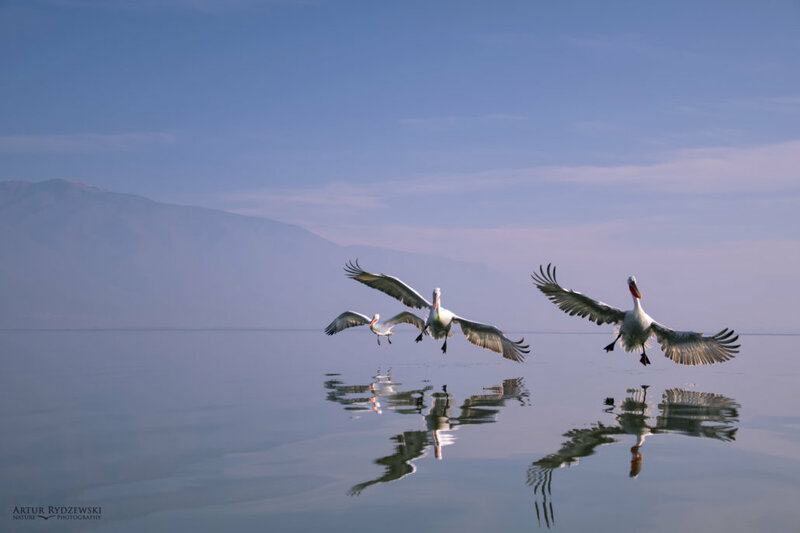 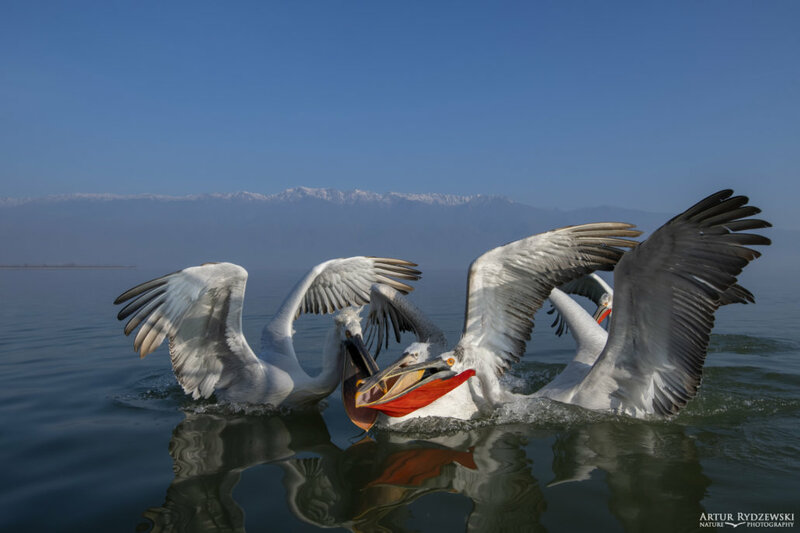 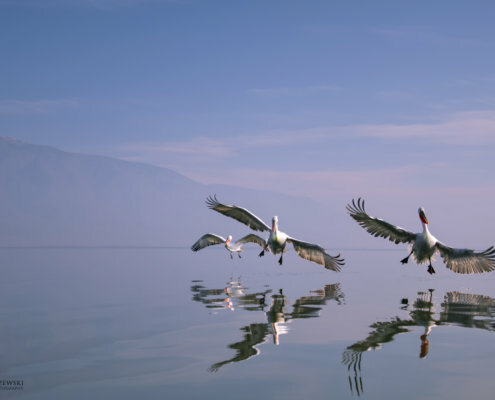 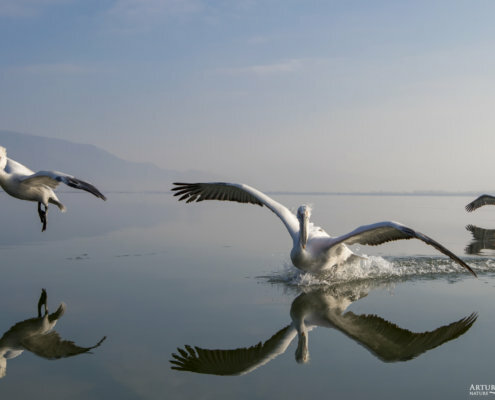 They are elegant soaring birds, with wingspans that rival that of the great albatrosses and their flocks fly in graceful synchrony. 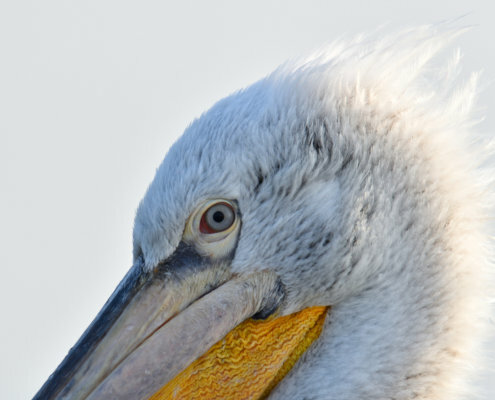 It is a short to medium distance migrant between breeding and overwintering areas. 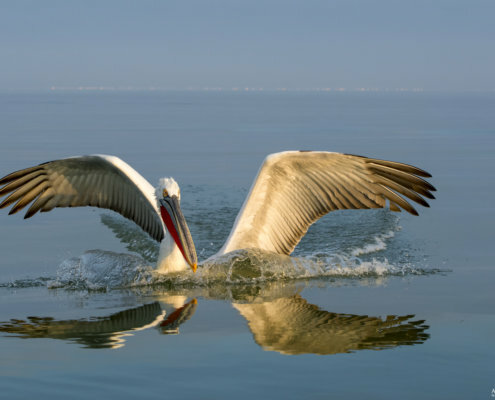 As with other pelicans, the males are larger than the females, and likewise their diet is mainly fish. 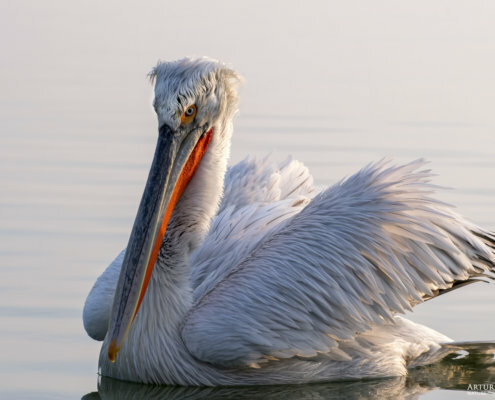 Their curly nape feathers, grey legs and silvery-white plumage are distinguishing features, and the wings appear solid grey in flight. 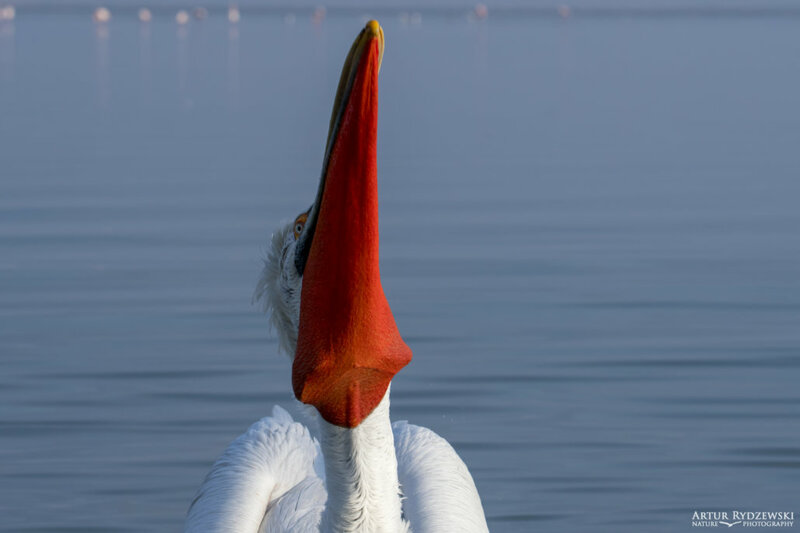 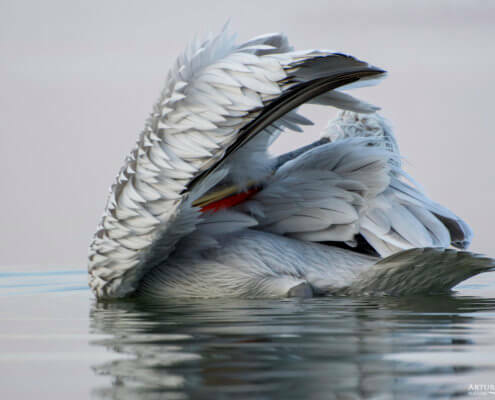 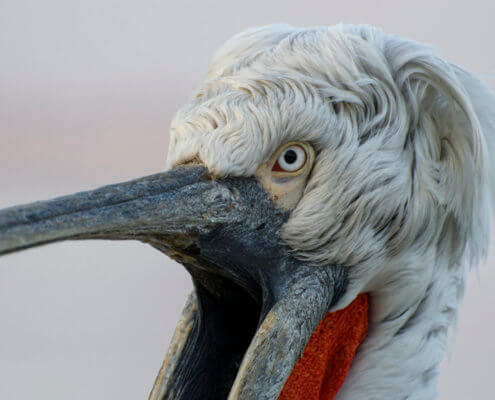 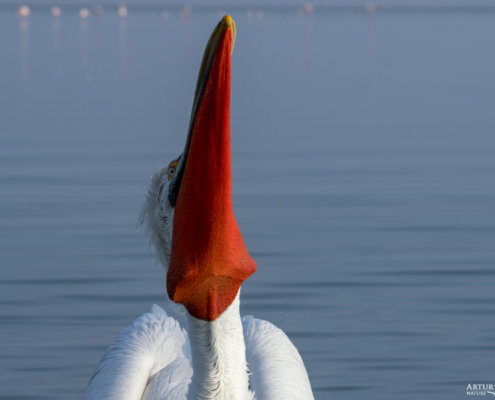 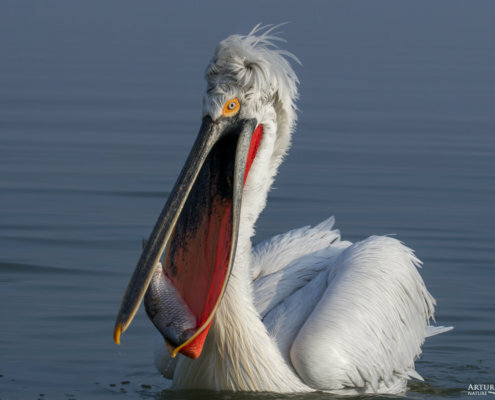 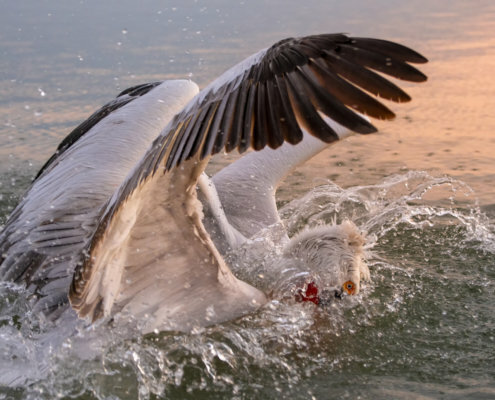 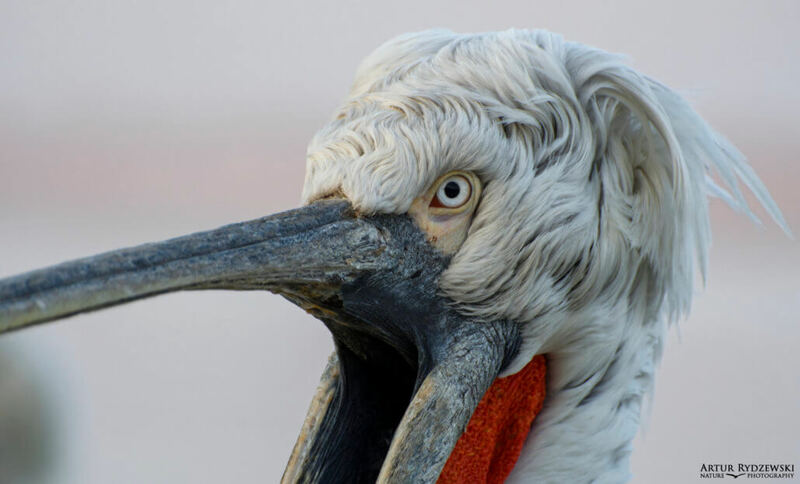 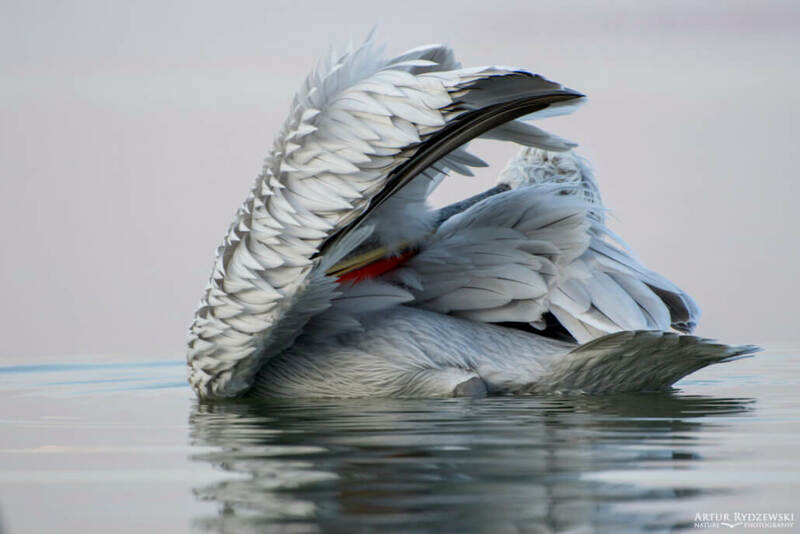 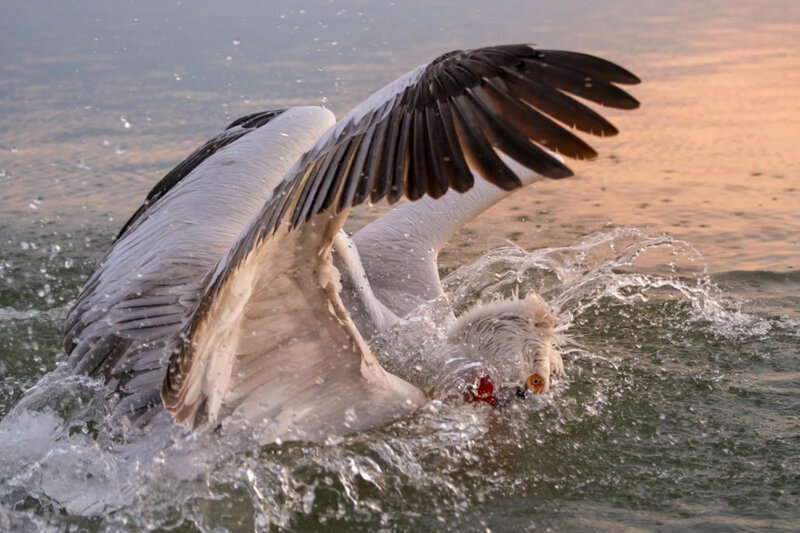 The adults acquire a drabber plumage in winter, however, when they may be mistaken for great white pelicans. 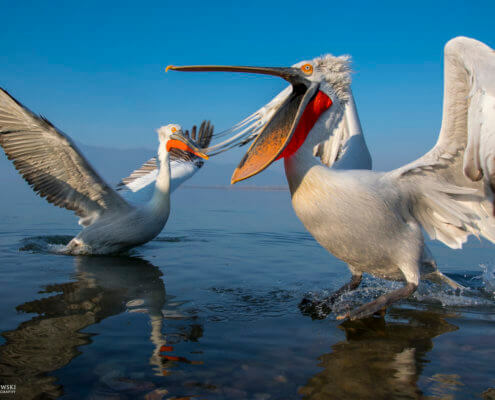 Their harsh vocalizations become more pronounced during the mating season. 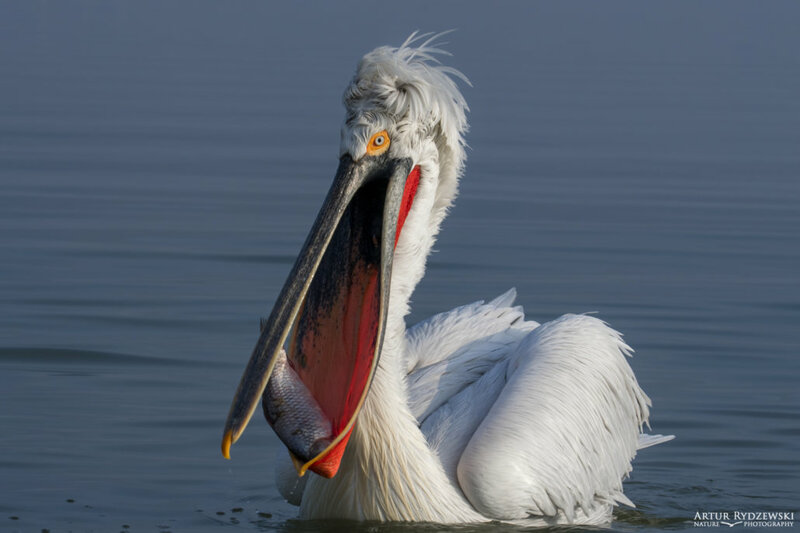 They breed from southeastern Europe to Russia, India and China in swamps and shallow lakes. 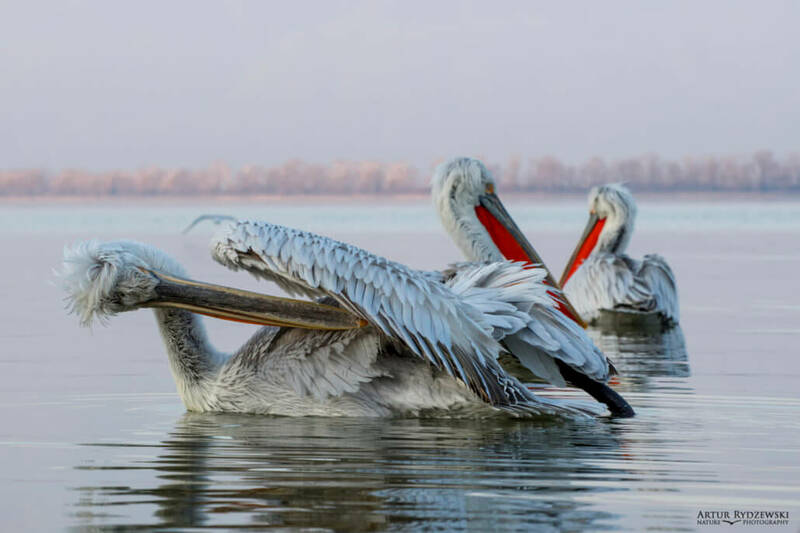 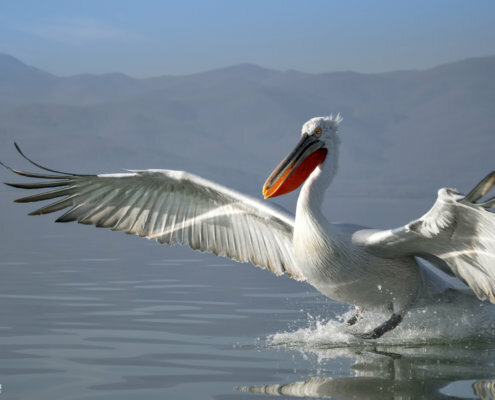 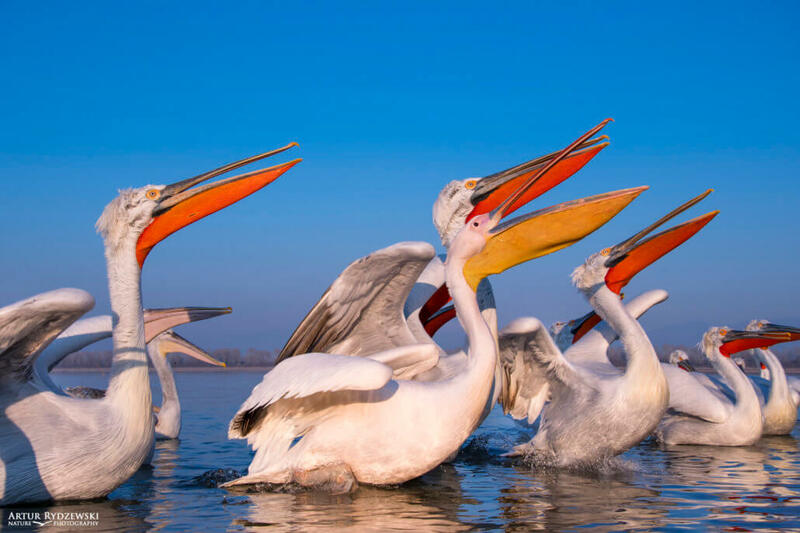 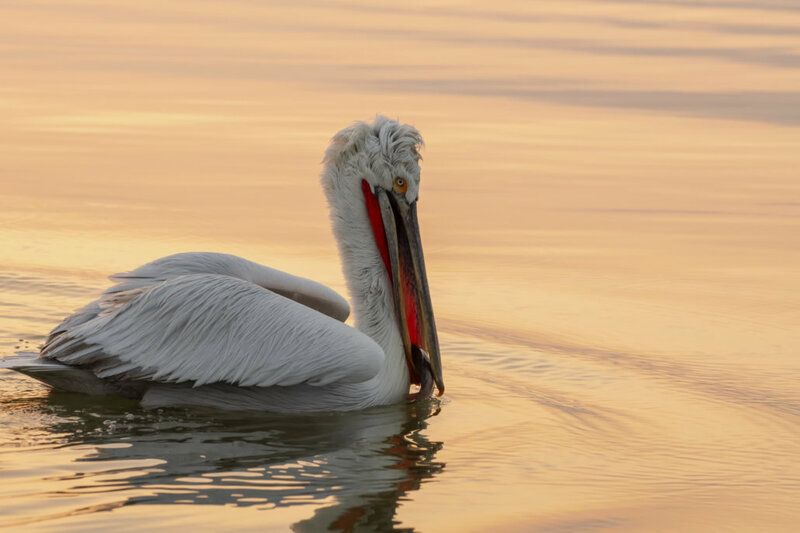 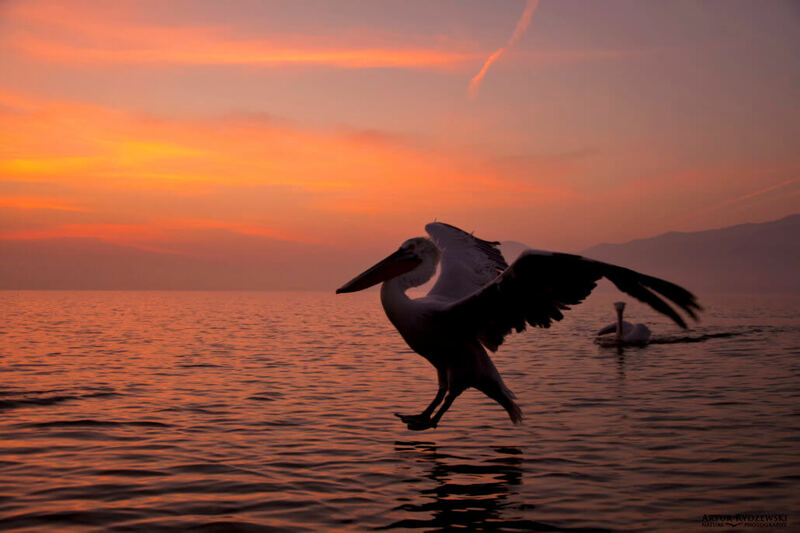 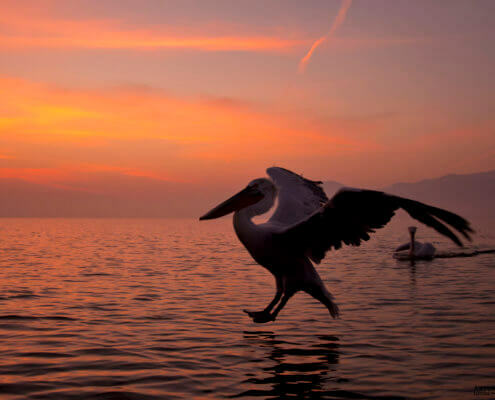 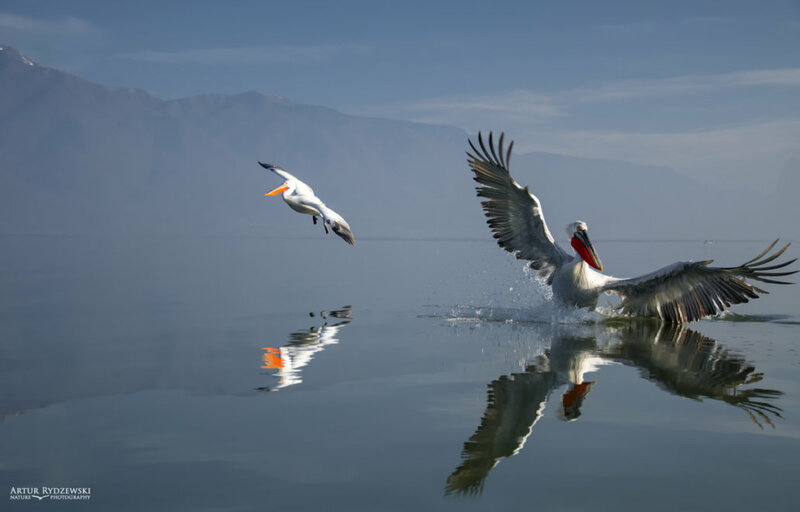 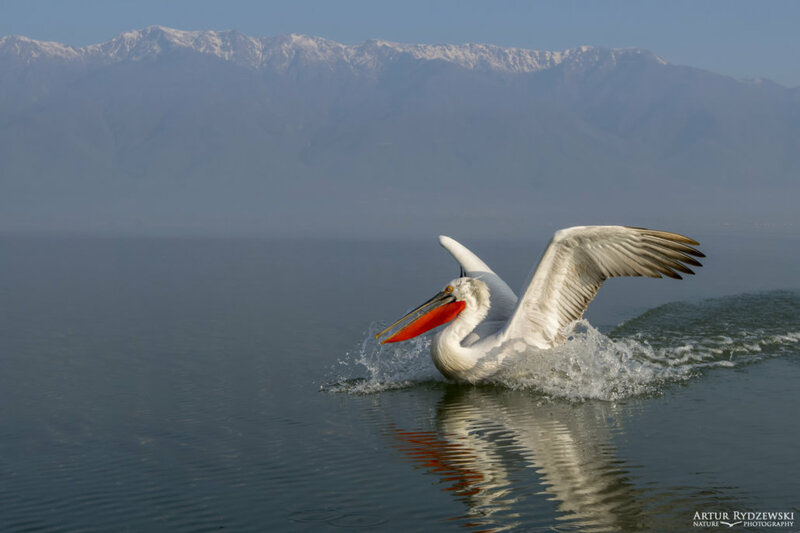 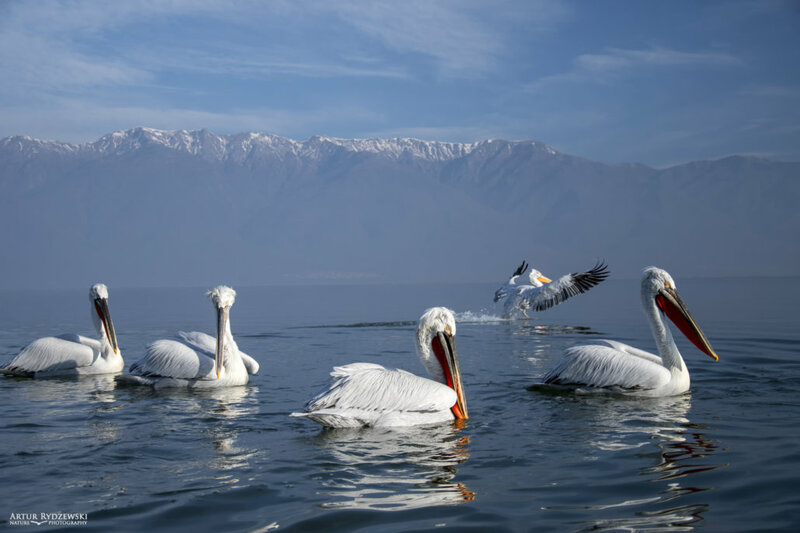 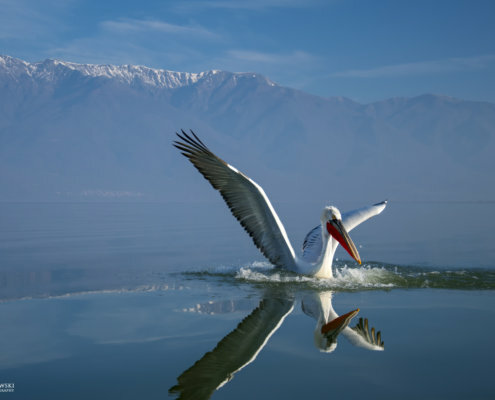 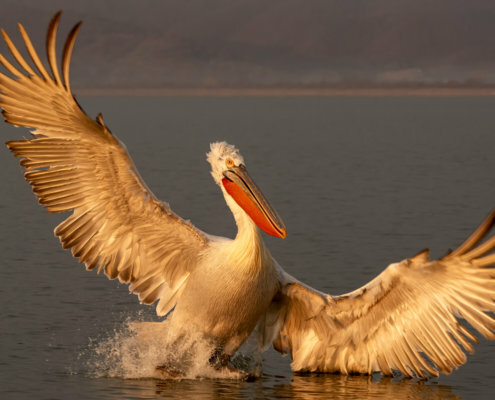 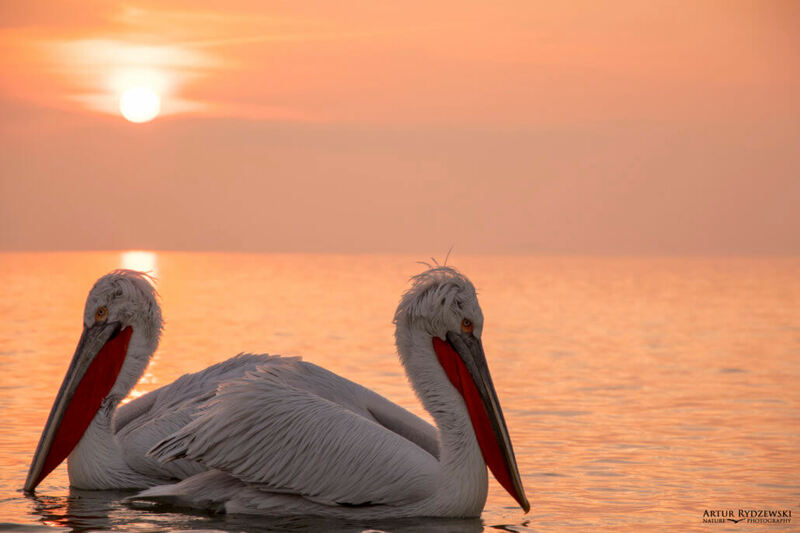 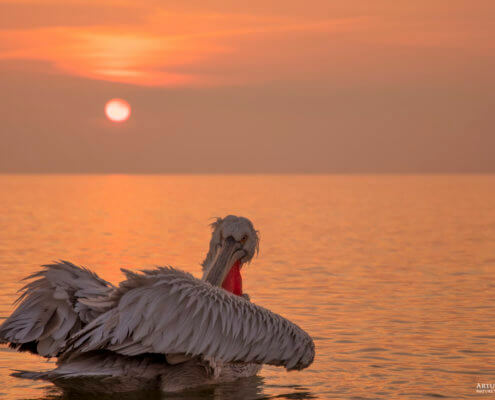 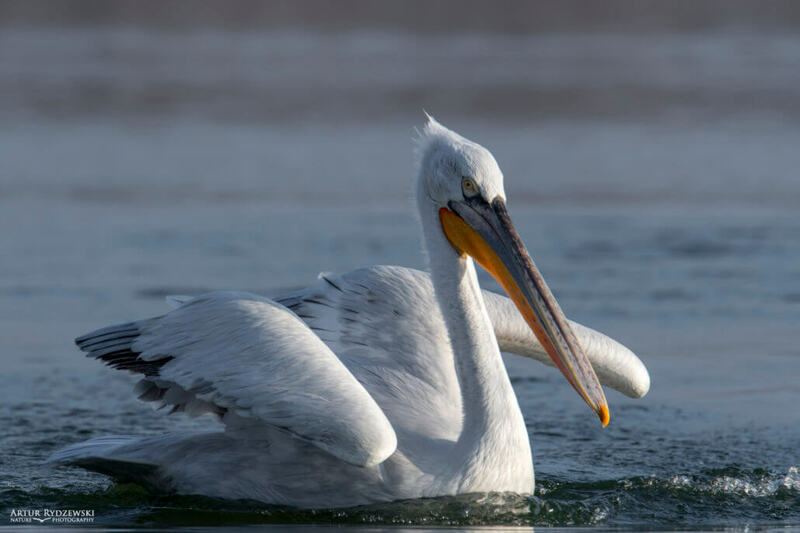 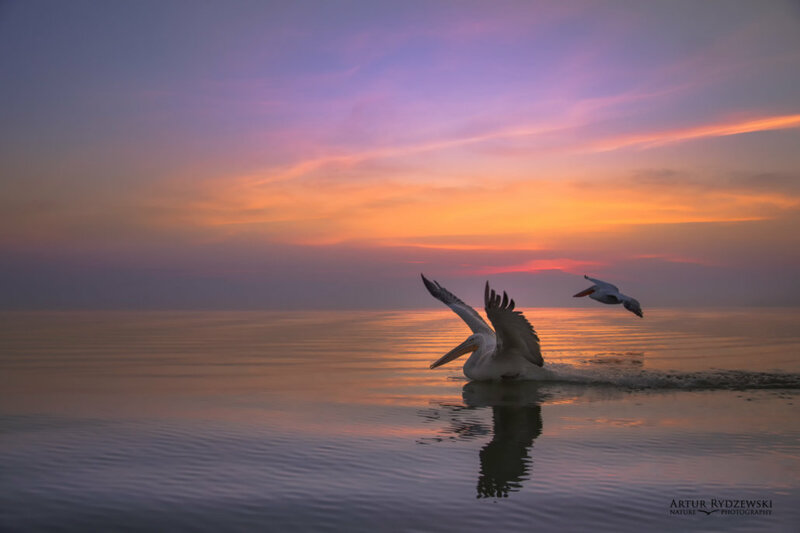 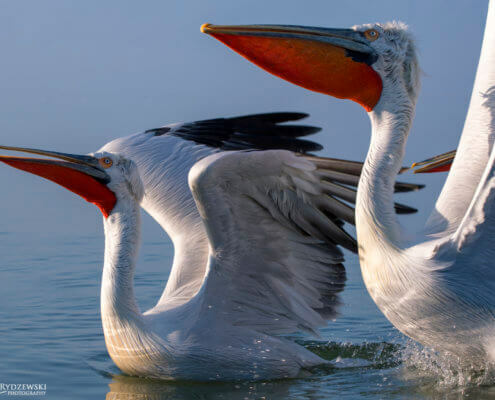 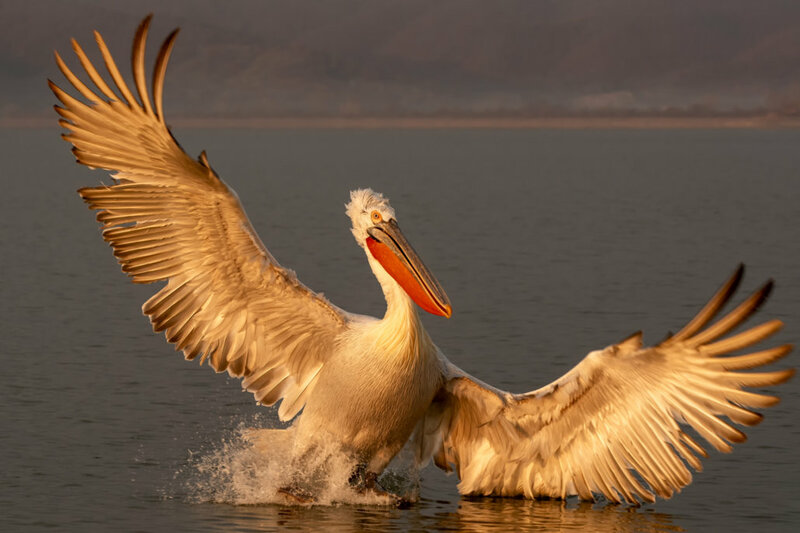 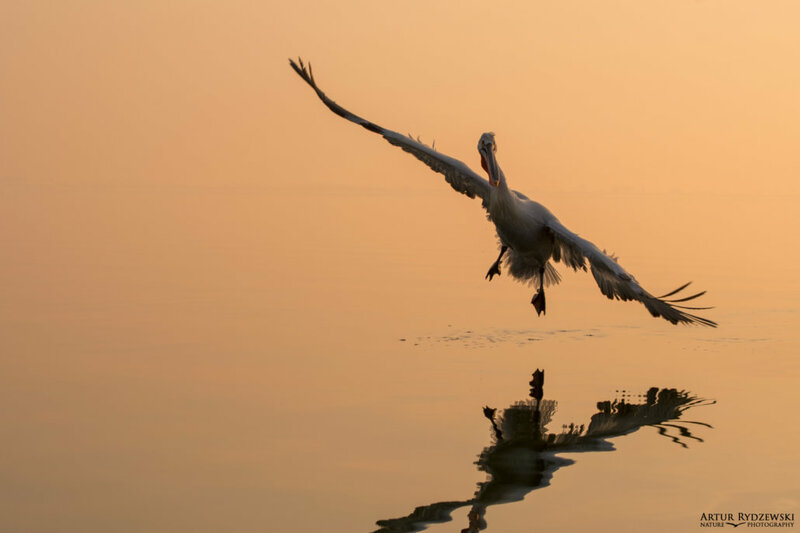 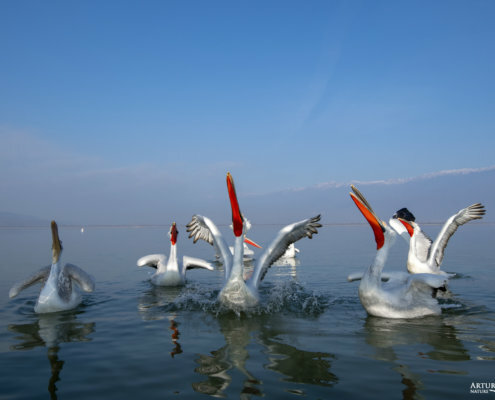 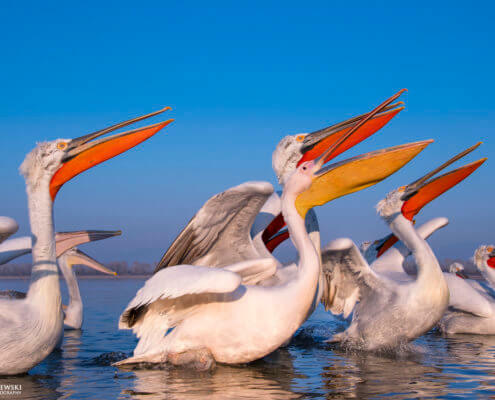 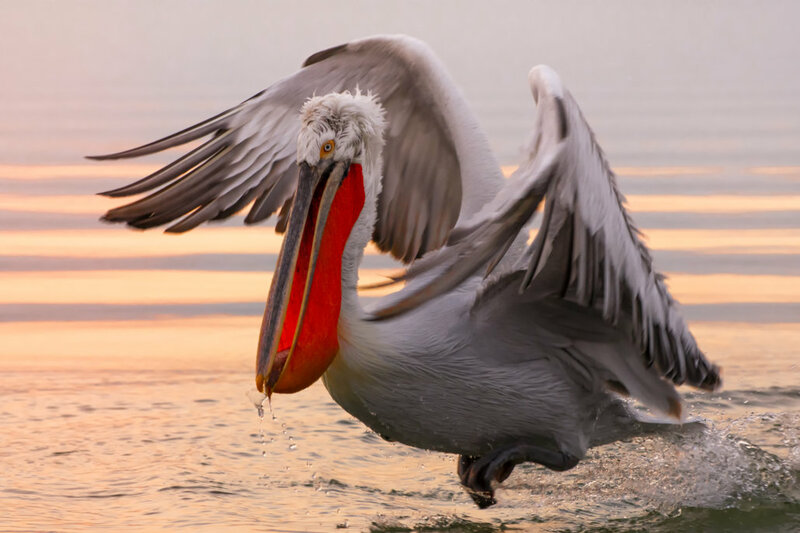 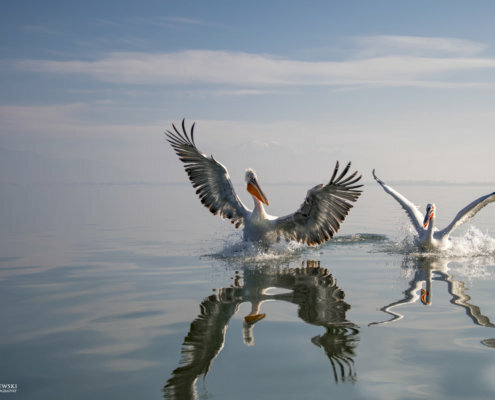 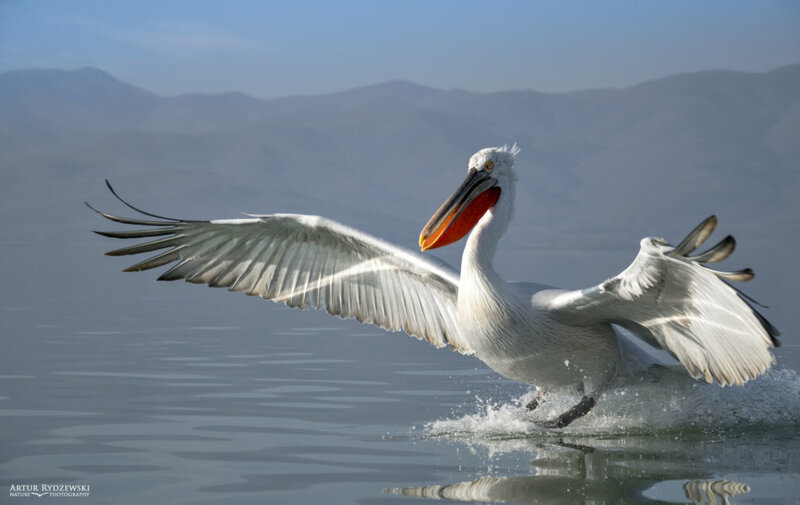 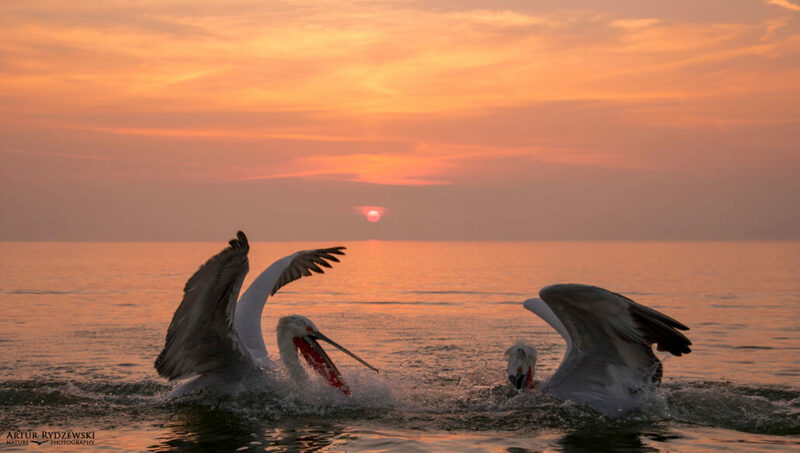 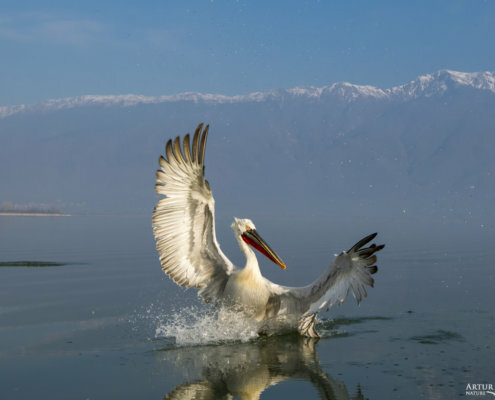 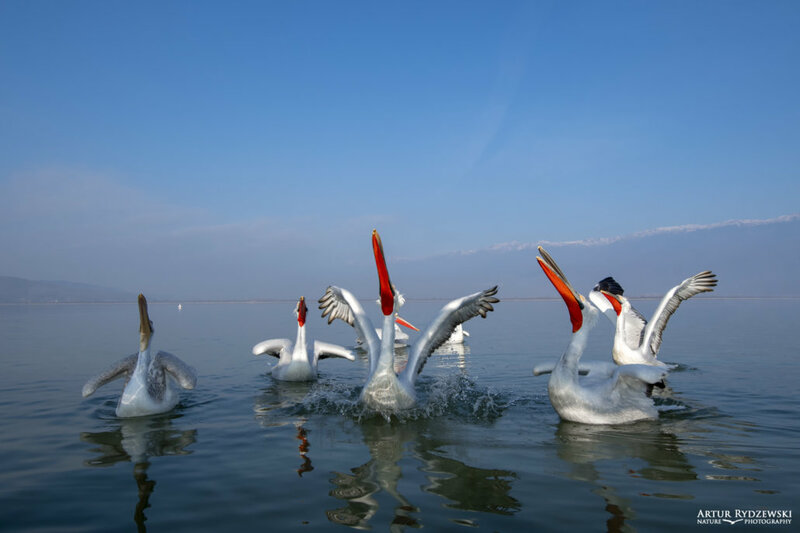 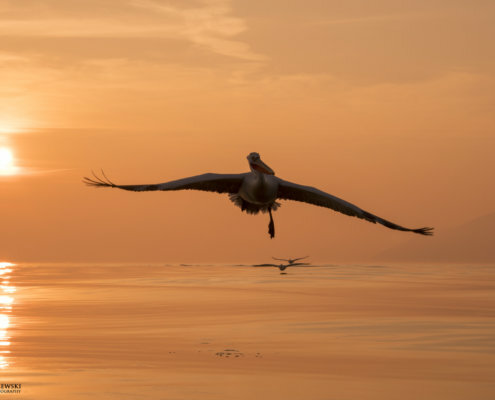 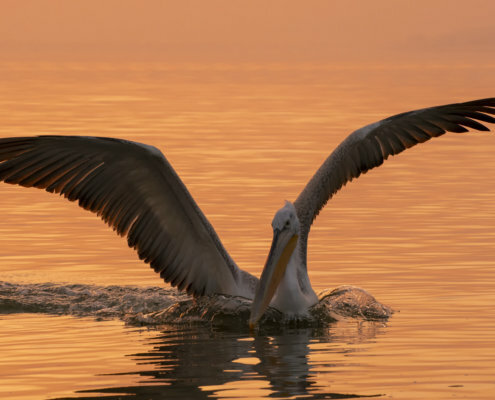 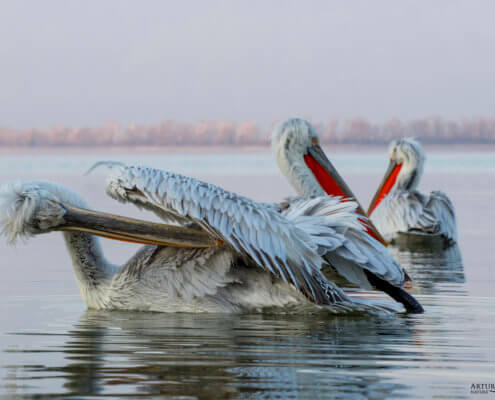 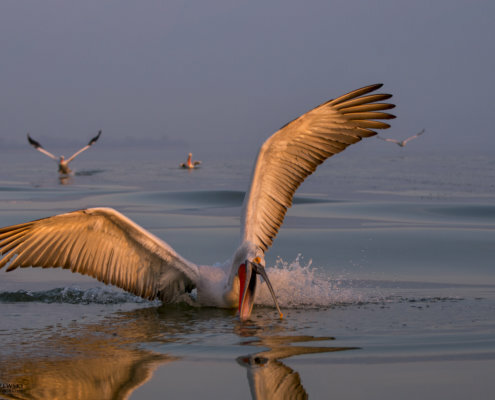 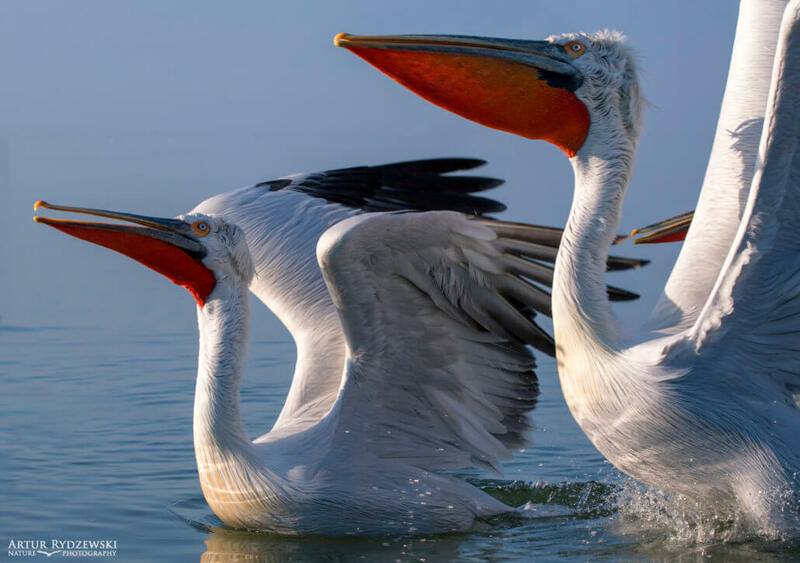 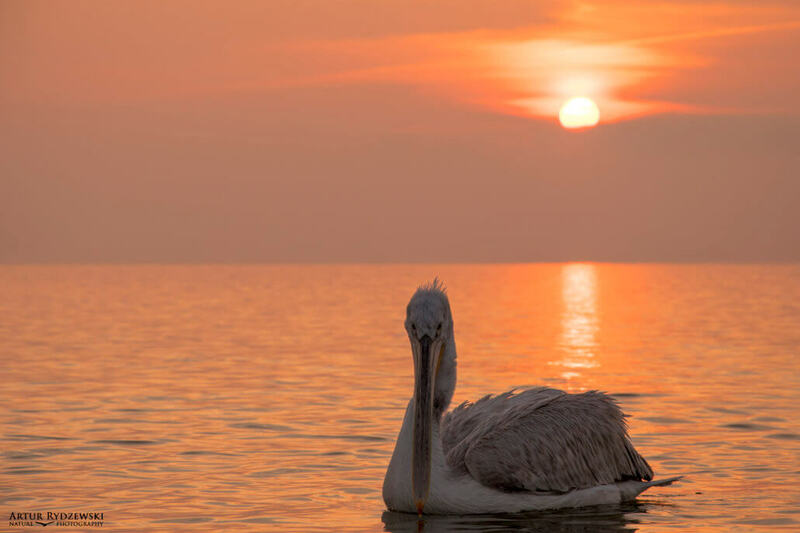 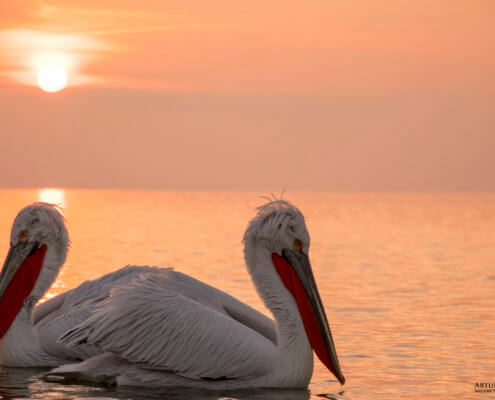 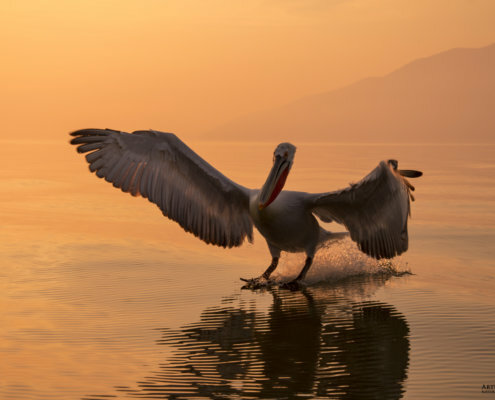 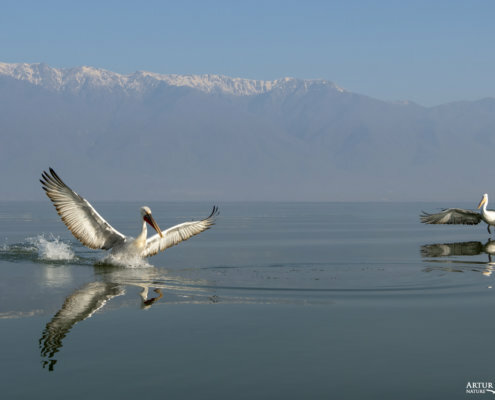 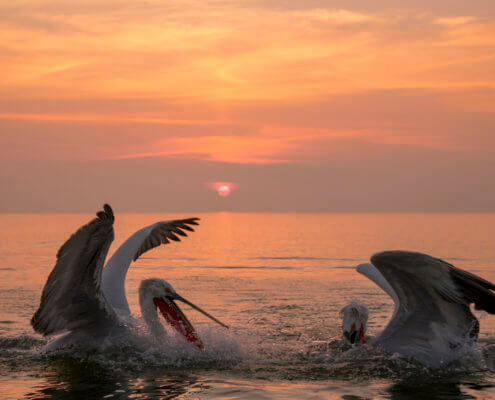 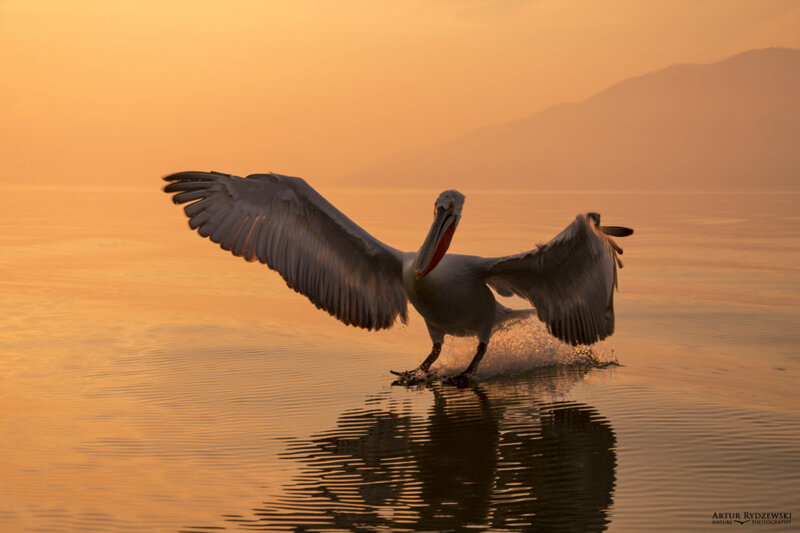 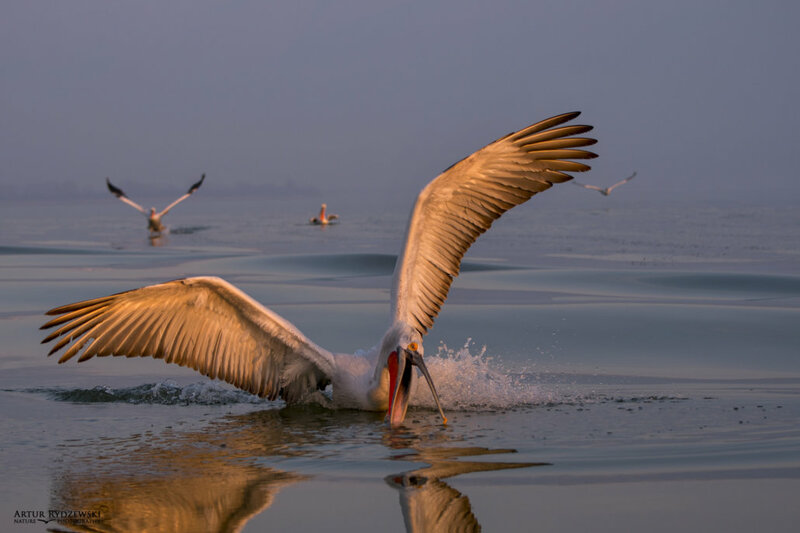 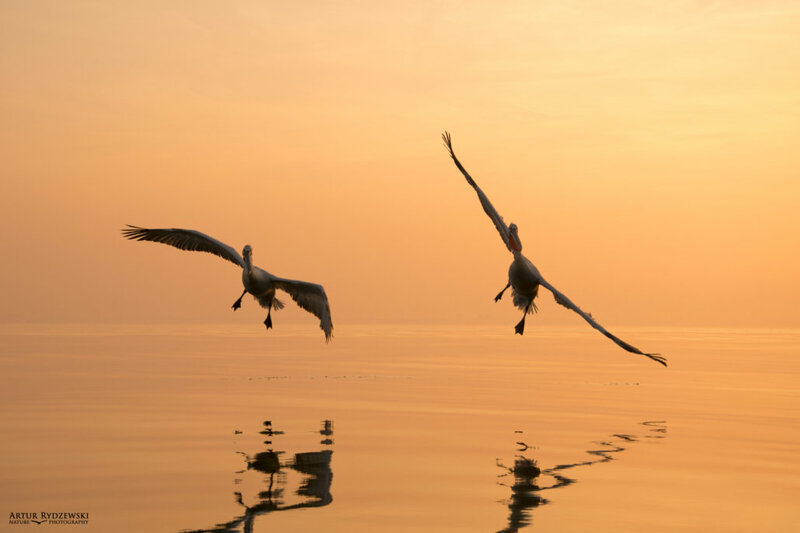 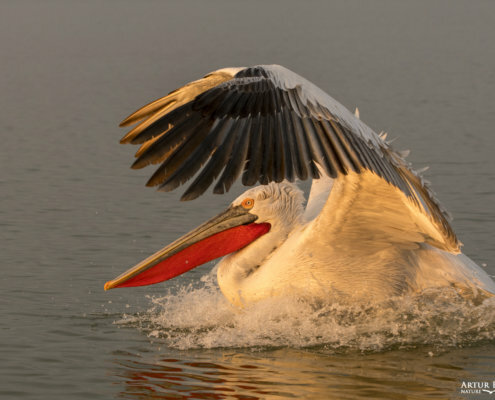 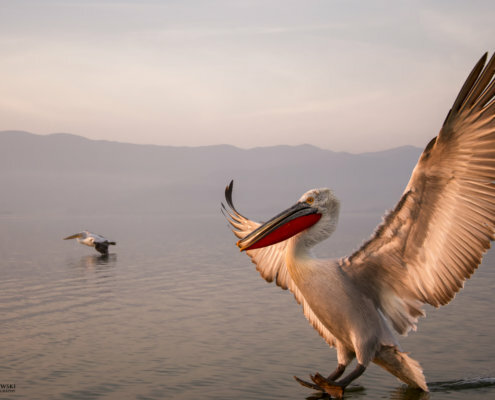 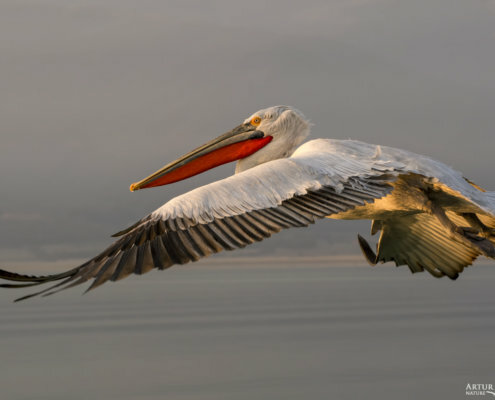 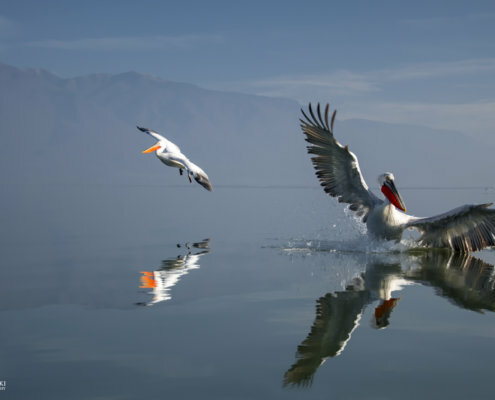 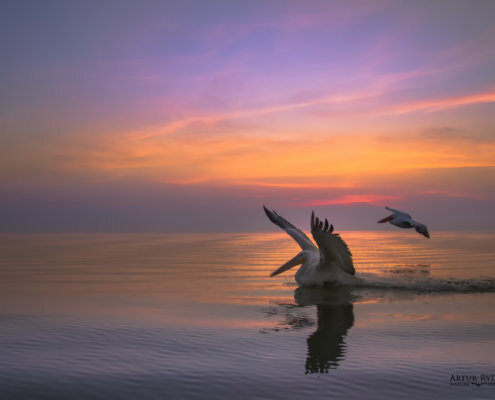 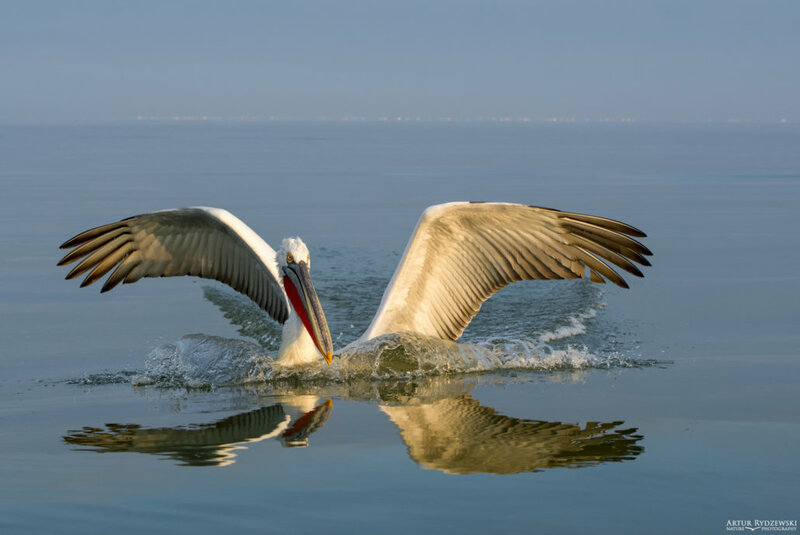 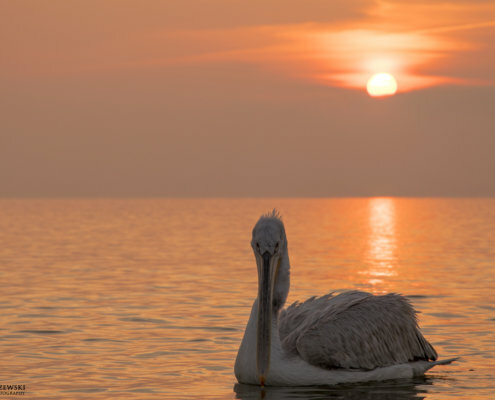 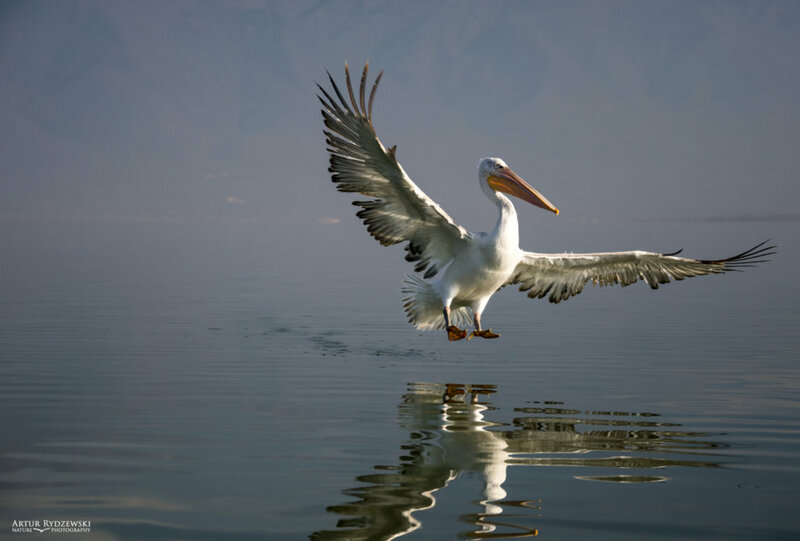 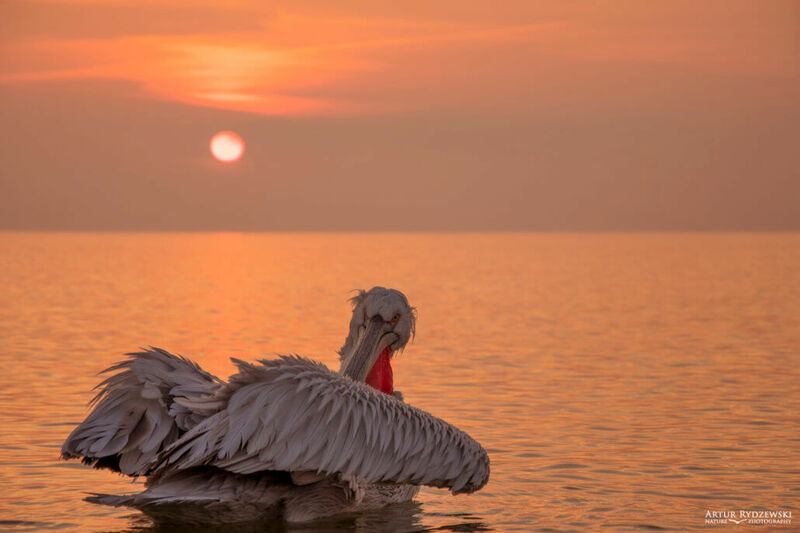 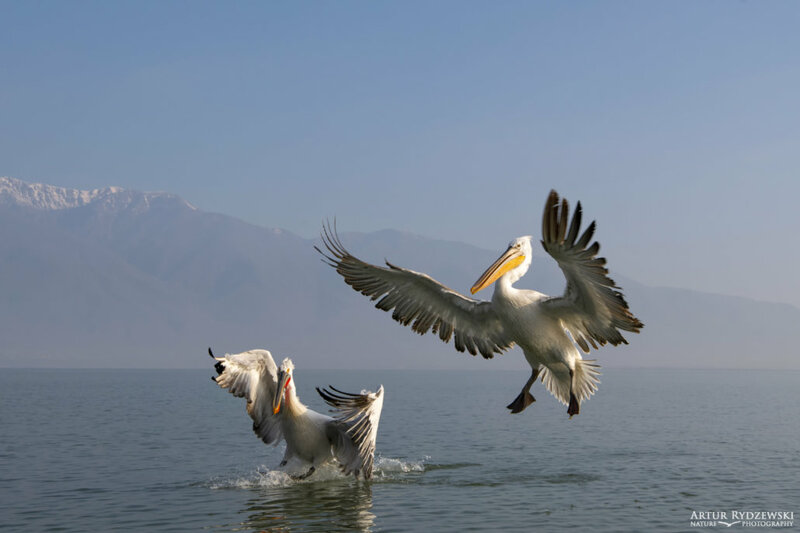 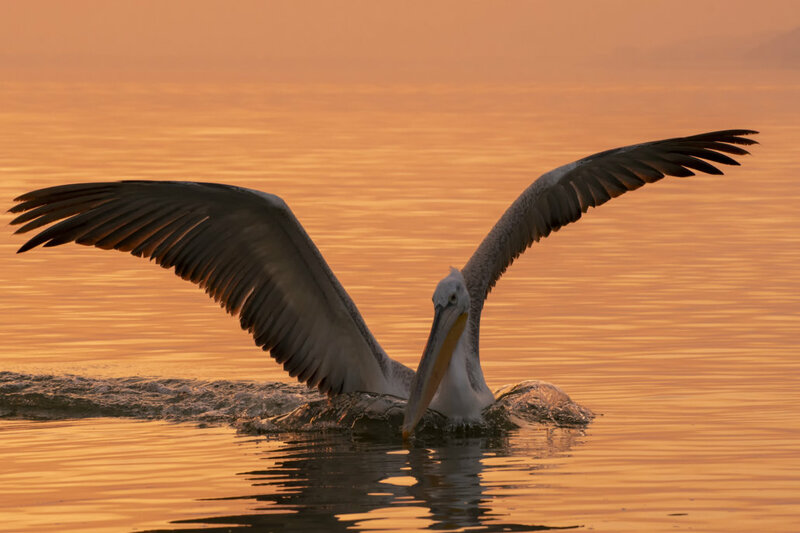 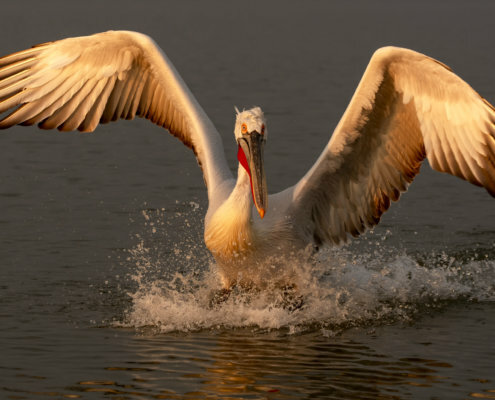 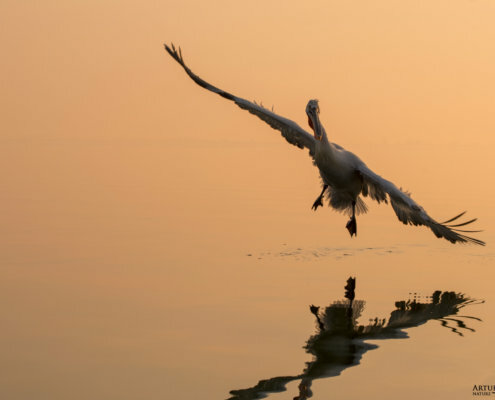 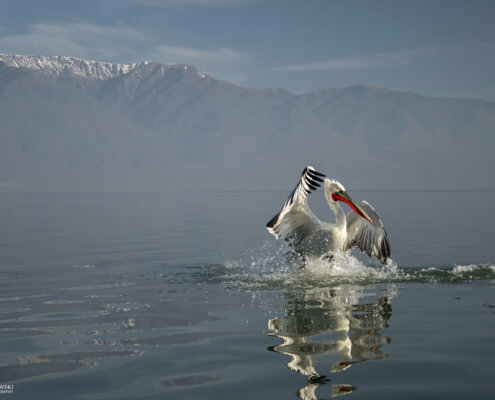 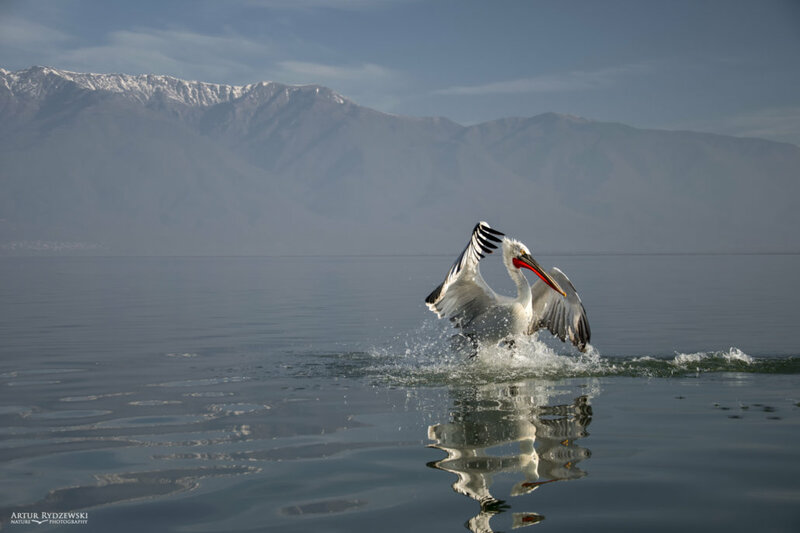 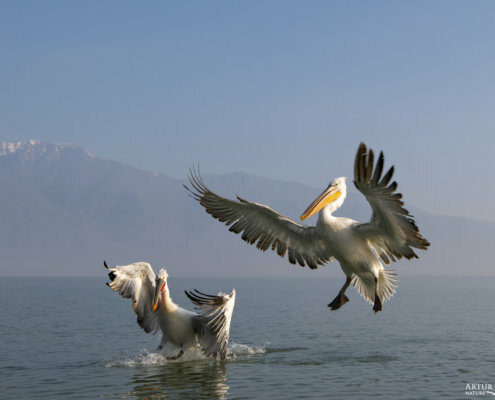 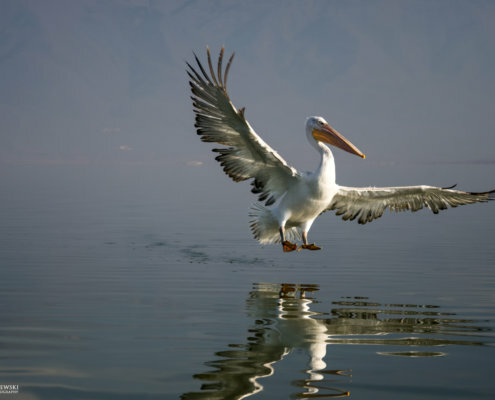 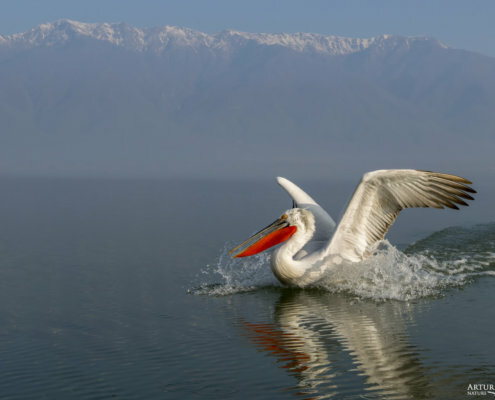 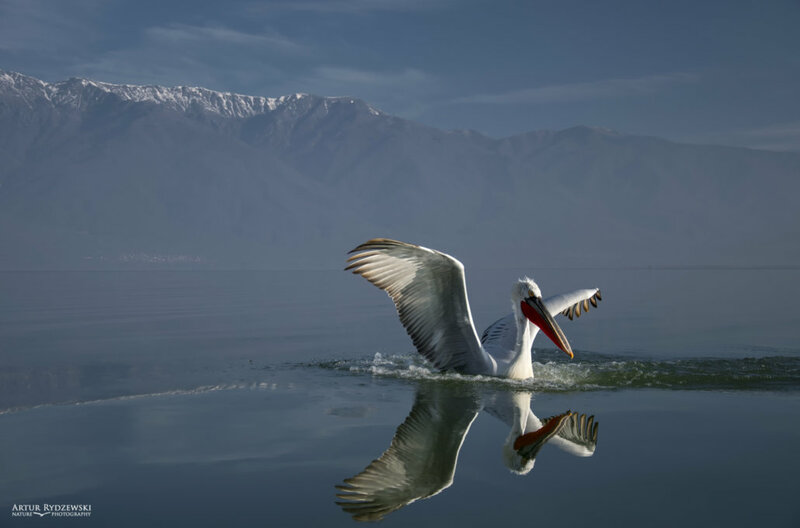 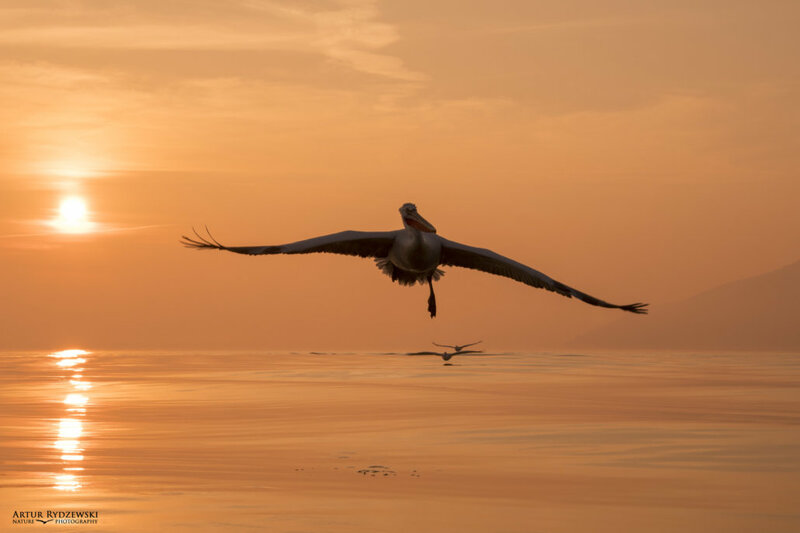 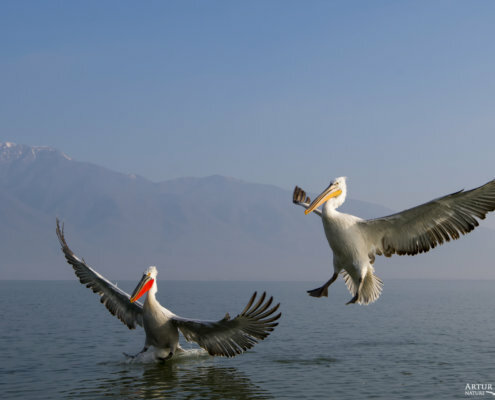 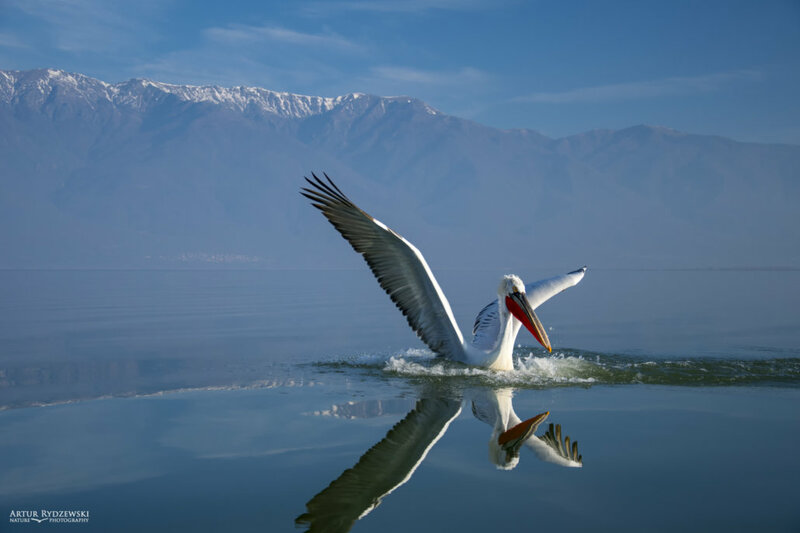 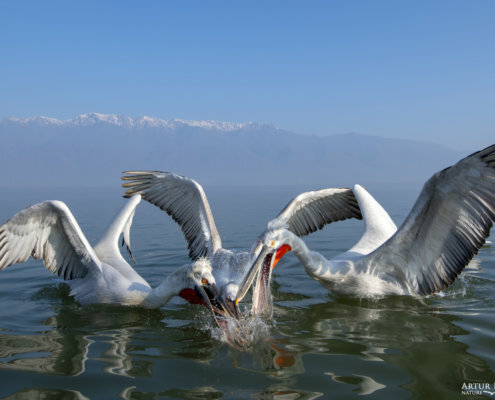 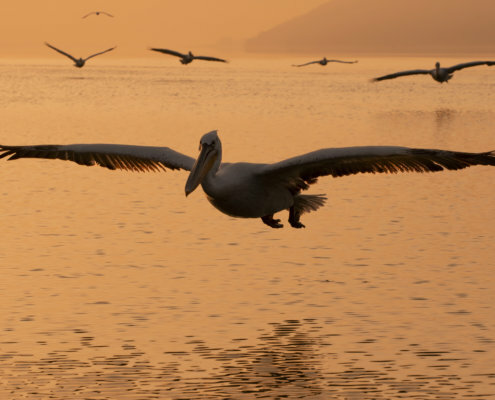 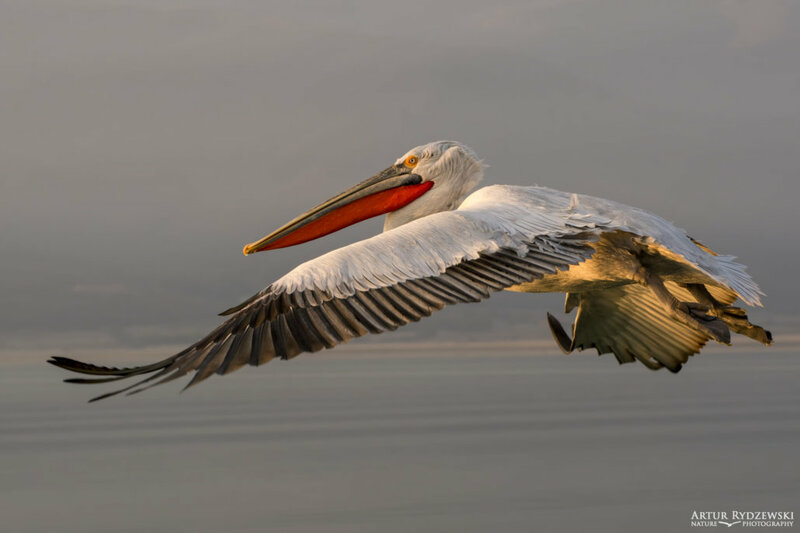 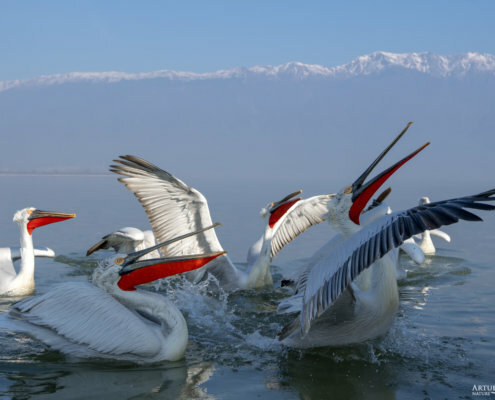 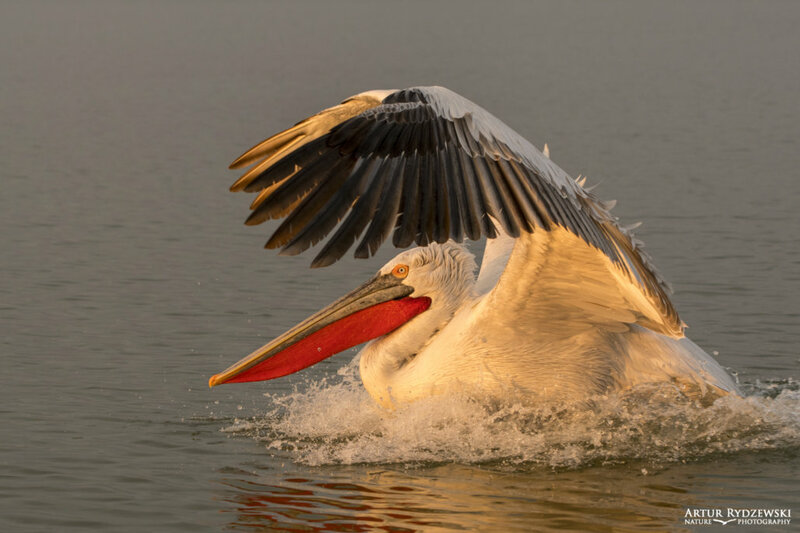 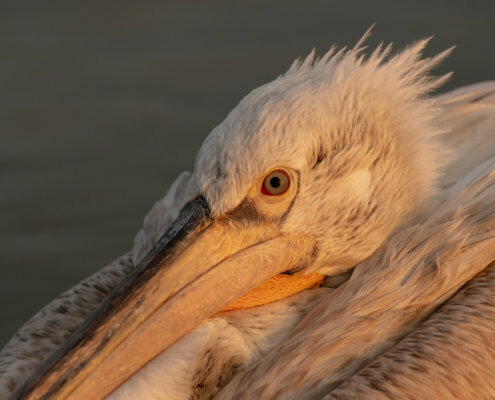 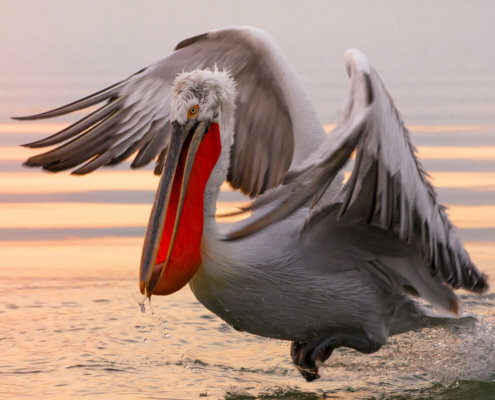 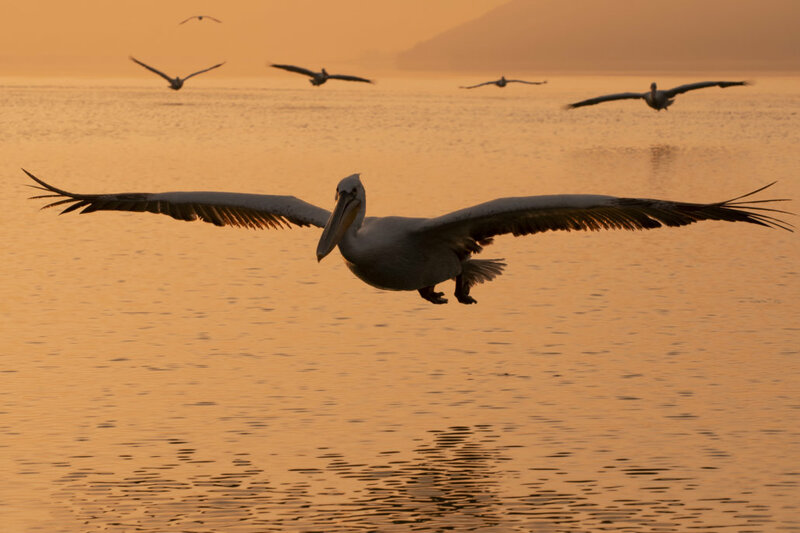 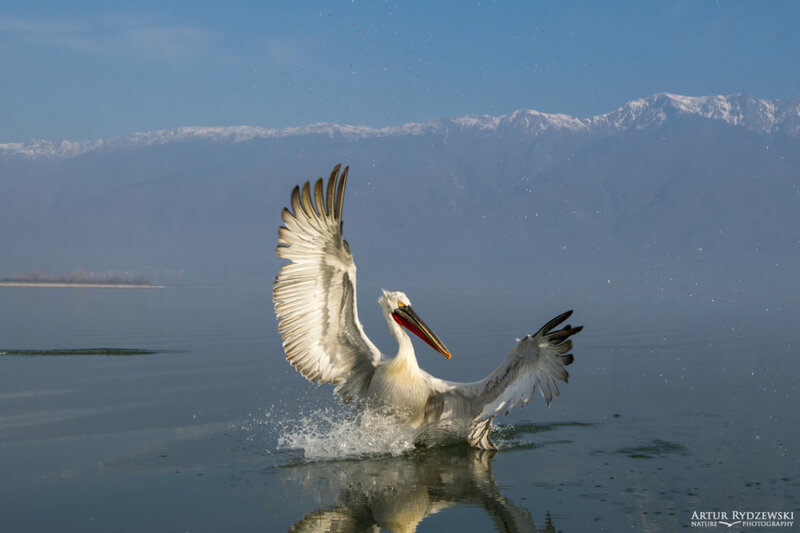 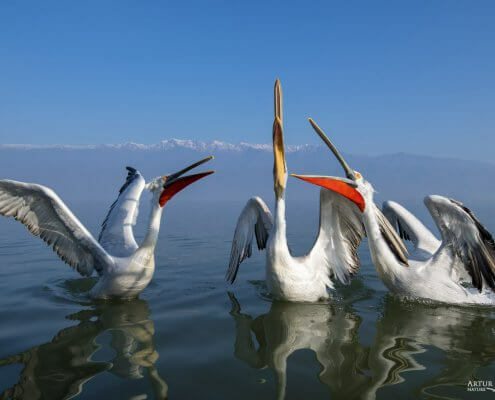 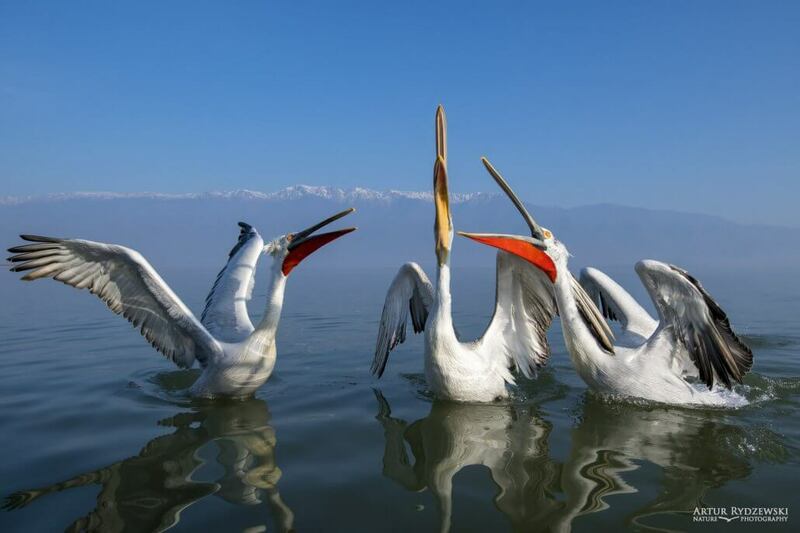 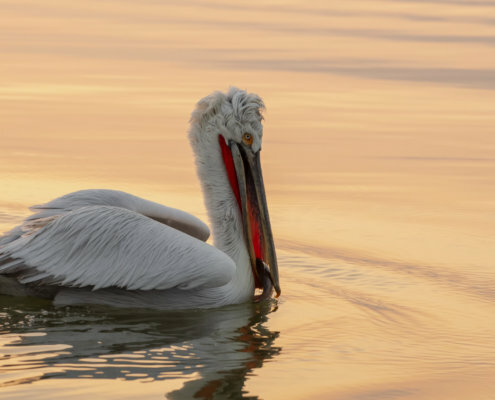 They usually return to traditional breeding sites, where they are less social than other pelican species. 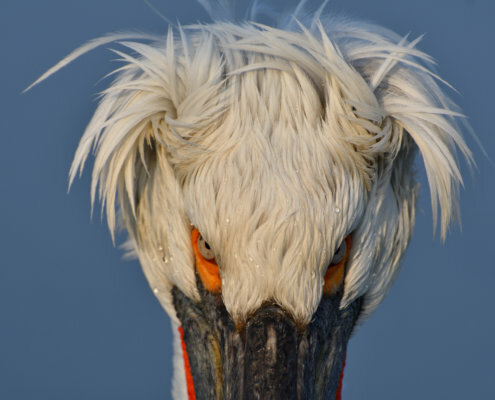 Their nests are crude heaps of vegetation, which are placed on islands or on dense mats of vegetation. 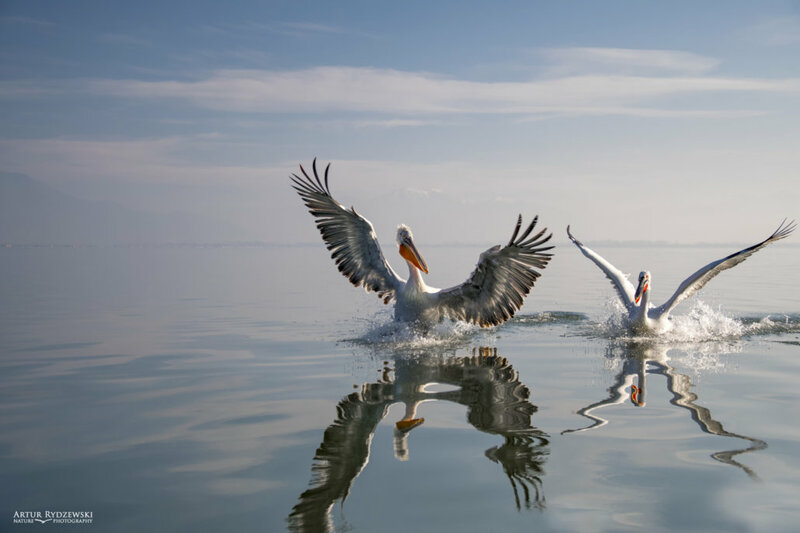 The species’ numbers underwent a dramatic decline during the 20th century, partly due to land use, disturbance and poaching activities. 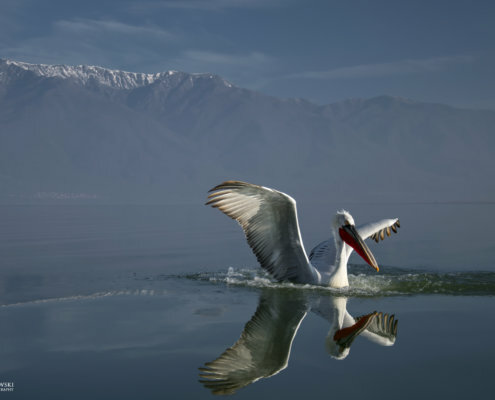 The core population survives in Russia, but in its Mongolian range it is critically endangered. 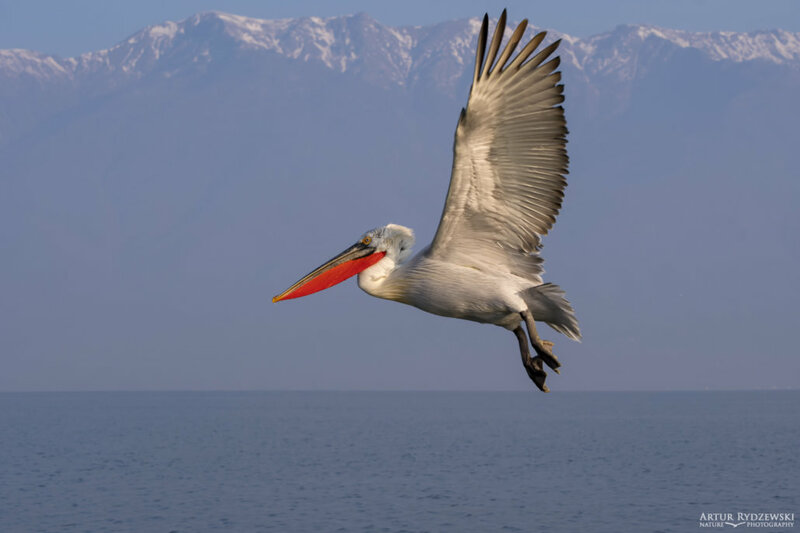 Removal of power lines to prevent collisions or electrocution, and the construction of nesting platforms or rafts have reversed declines locally.